Once the dust settled down and we got into a steady day-to-day operational flow I was able to take advantage of the fact that the machinery is well oiled and in place. This was apparent from the wide range of daily announcements, editorials that came from all areas in the Washington bureaucracy; the Art World and the Media. 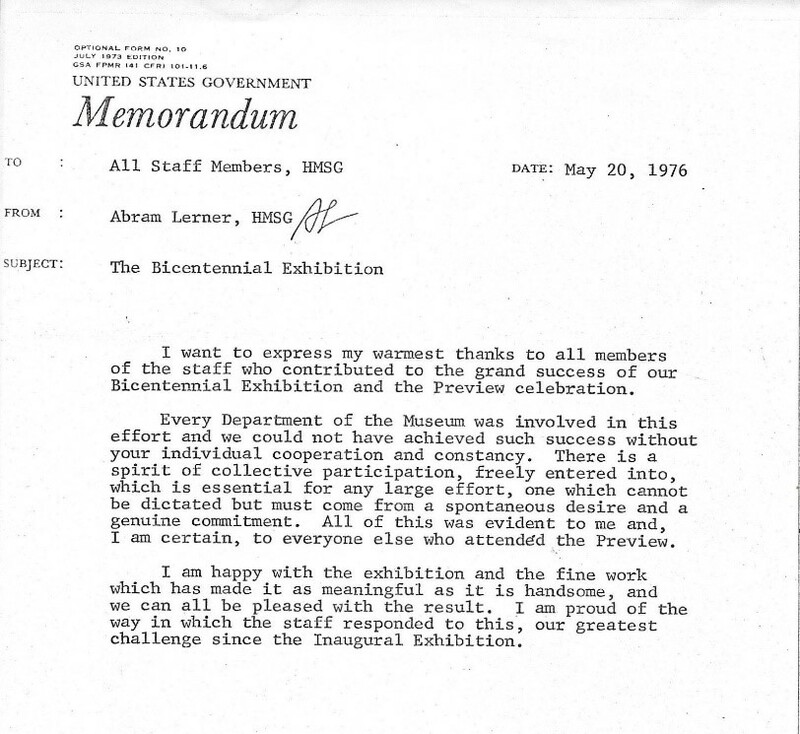 In this final segment the Hirshhorn accomplishment, I’m not going to leave you with a smattering of the writings describing this period but provide you with many of the wonderful letters, documents and expressions of appreciation that took place once the Museum became operational after it opened on October 1, 1974 and became firmly entrenched in the Washington scene beginning in 1975 and continuing through 1976. 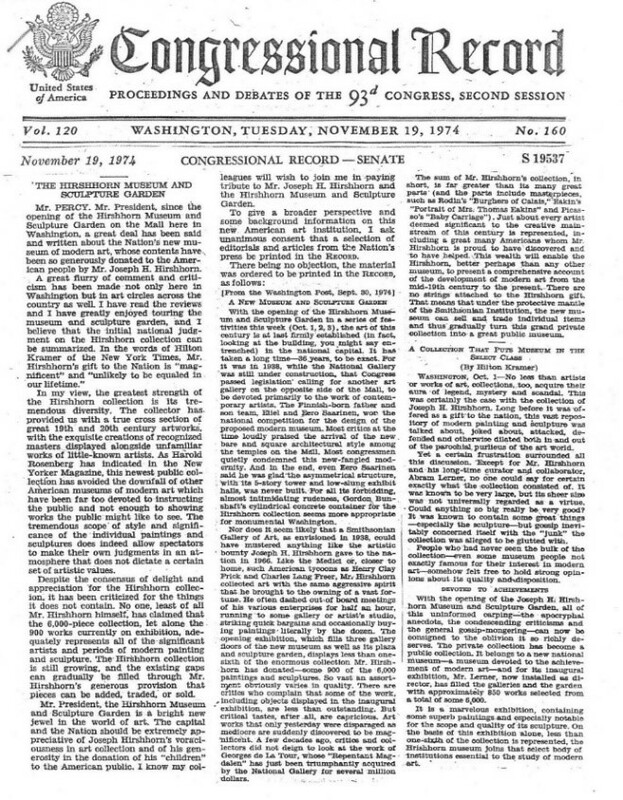 The Congressional Record entry dated November 19, 1974; the Senate, from Sen. Charles Percy, (Illinois) summed up his thoughts about the opening of the Hirshhorn Museum and Sculpture Garden on the Mall in Washington. With a flourish of comments filled with criticism that had been leveled in Washington and in art circles around the country as well as reading reviews, he toured and greatly enjoyed the Museum and Sculpture Garden and believes the initial judgment on the Hirshhorn collection can be summarized in the words of Hilton Kramer of the New York Times, Mr. Hirshhorn’s gift to the nation is “magnificent” and “unlikely to be equal in our lifetime.” In my view, the greatest strength of the Hirshhorn collection is its tremendous diversity. The collector provided us with a true cross-section of great 19th and 20th century art works. With the exquisite creations of recognized Masters displayed alongside unfamiliar works of little-known artists. The above letter from SI Assistant Treas. 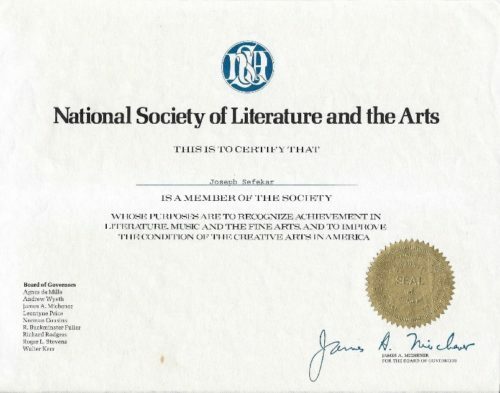 John F Jamison was most kind and heartfelt giving me more credit that I would not normally receive but seeing it in writing makes all the difference. The Calendar of the Smithsonian Institution gave us an air of legitimacy. We did have our share of new activities, exhibits and we were getting into the mainstream of this wonderful way of allowing Americans and world visitors to enjoy and enhance their knowledge of so many facets of our life and history. The staff was up to the challenge of keeping current with the myriad of art related functions that we were planning over the course of the next few years. The next target was the Bicentennial for the United States that was looming less than two years away. One of the things that I would take an interest in was the building and construction of another eagerly anticipated new Museum that was bound to attract a lot of attention. The Air and Space Museum was scheduled to kick off during the Bicentennial activities over July 4th holiday. I did have a number of assignments that would keep me apprised of how things were taking shape across the street. The proximity to the Hirshhorn Museum made it a no-brainer that we needed to be involved and actually share what we had learned from our “meteoric rise” and getting the Hirshhorn started, worked on and completed. It also afforded me the opportunity to come in contact with their newly rising stars that would play an important part in seeing this sparkler also become a fixture on Capitol Mall. 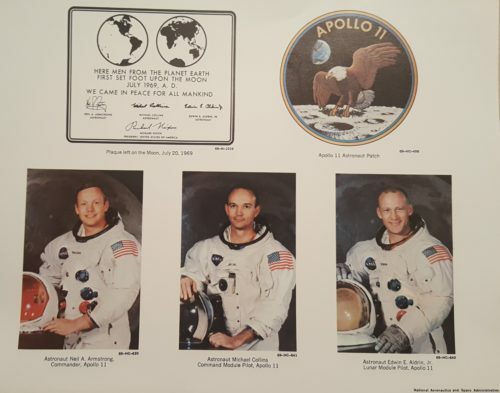 The newly appointed Curator for the Museum was none other than Mr. Michael Collins, of Apollo 11 fame (Commander, Lunar Module) of which I kept Memorabilia that appears in the previous chapter. I relished this opportunity to impart some of my knowledge and experience knowing what it was like to be a fledgling, new kid on the block. It was an exceptional event and Thelma and I were glad to be part of it. But this did not keep us from getting our first major, eye-opening exhibit ready to make our own contribution to the American Bicentennial. 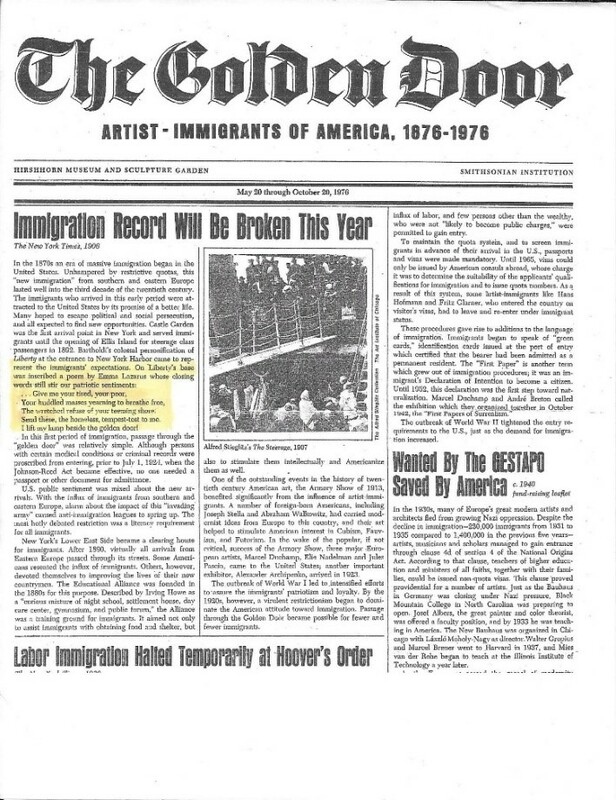 The plan was put into place to acknowledge the contribution of the “Immigrants’” over the last 100 years that have come to our shores with the emphasis on Immigrants’ Art Influence. …Give me your tired, your poor, your huddled masses yearning to breathe free, the wretched refuse of your teeming shore; send these, the homeless, tempest-tossed to me: I lift my lamp beside the Golden door! Their acceptance was a cyclical thing; the immigrants’ lot would go through periods of increases and decreases. In the article, the last paragraph states “the outbreak of World War I led to intensified efforts to assure the immigrants’ patriotism and loyalty. By the 1920s, however, a virulent restrictionism began to dominate the American attitude towards immigration. Passage to the Golden Door became possible for fewer and fewer immigrants.” How ironic that things haven’t changed much during the passage of all these years. 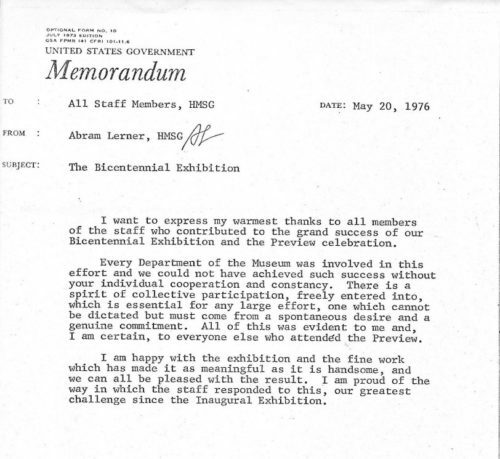 The Bicentennial exhibit proved to be a huge access. There were many parties to attend, over 20 celebrations; I would be there. Staff was warranted their own acclamation. 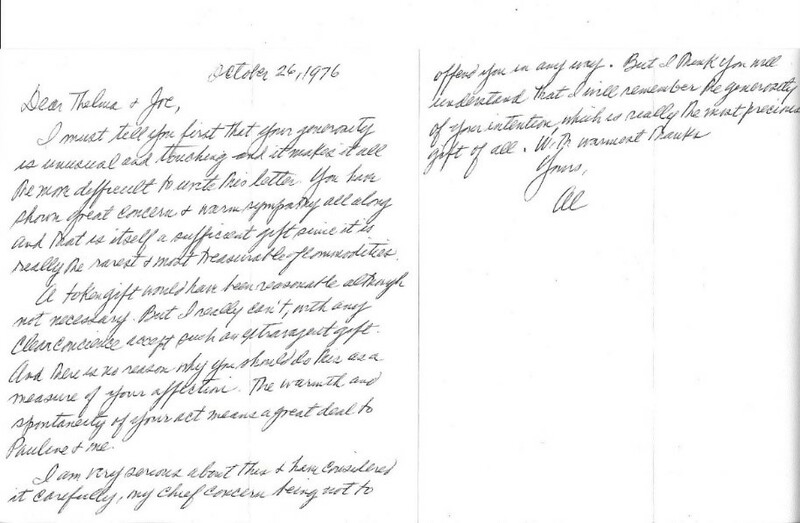 I was constantly working on good employee relations: Jim and superintendent Frank; Lee getting the OK to work at home. The list of current staff members evoked a tumultuous roar of pleasant memories. June 10, 1970 my starting date was safely ensconced between hiring the first staff members Frank and Francie in 1970. Ms. Sewall and Assistant Curator Stephen Weil, “who likes to rock boats.” The great cataloguing by Anne in the library; my final interview with JHH in 1970 before officially starting. I had developed a pretty good bond with Al Lerner over the years and as I could see the light at the end of the tunnel, there were some things that Thelma and I wanted to impart to Al and Pauline Lerner to show them how much all their good tidings over the years meant. So we came up with something that reflected our utmost appreciation. I must tell you first that your generosity is unusual and touching and it makes it all the more difficult to write this letter. You have shown great concern and warm sympathy all along and that is itself a sufficient gift since it is really the rarest and most treasured of commodities. A token gift would have been reasonable although not necessary. Figure #9-29 and Figure #9-30 The Bicentennial celebration afforded Thelma and me and to revisit some of the galleries and exhibits. 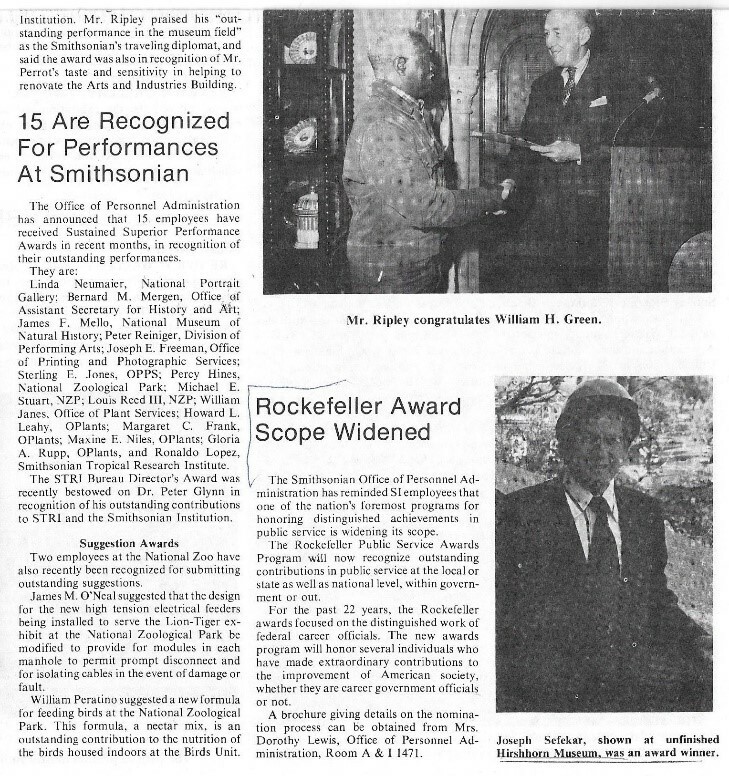 Two amazing milestones that took place during this period were my entry in America’s Who’sWho in Government and being recommended for the prestigious Rockefeller Administrative Award. 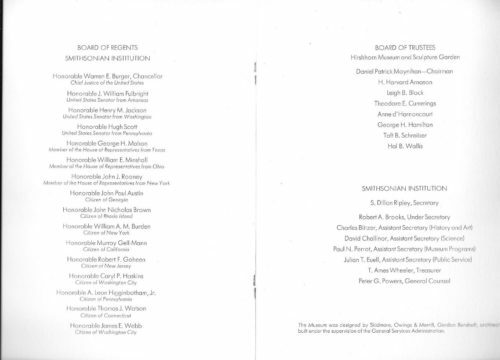 In July 1976, I was happily surprised to see that my submission of a biographical sketch was accepted by the publishers of Marquis Who’s Who in Government and included in the 2nd edition, 1975-76 in the publication of the same name. I record the entry below because of its simplicity and brevity, and the concise manner in which it reflects the highlights of my family history, schooling record, my occupation, my army career and service with the Hirshhorn Museum. 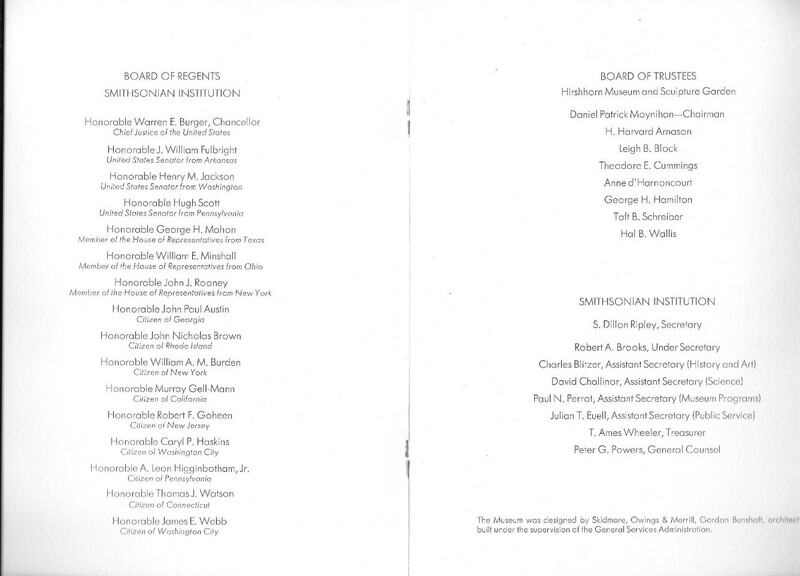 On April 9, 1976, Abram Lerner, Director, HMSG put my name in for Nomination for the Rockefeller public service award. He based this on my length of public service, dedicated career to the Federal government and to recognize distinguished service and contribution to the growth and prestige of the Smithsonian Institution. The above application states why he felt this was justified. One of my last the last Budget Submissions for FY 77; it would become effective the following year. 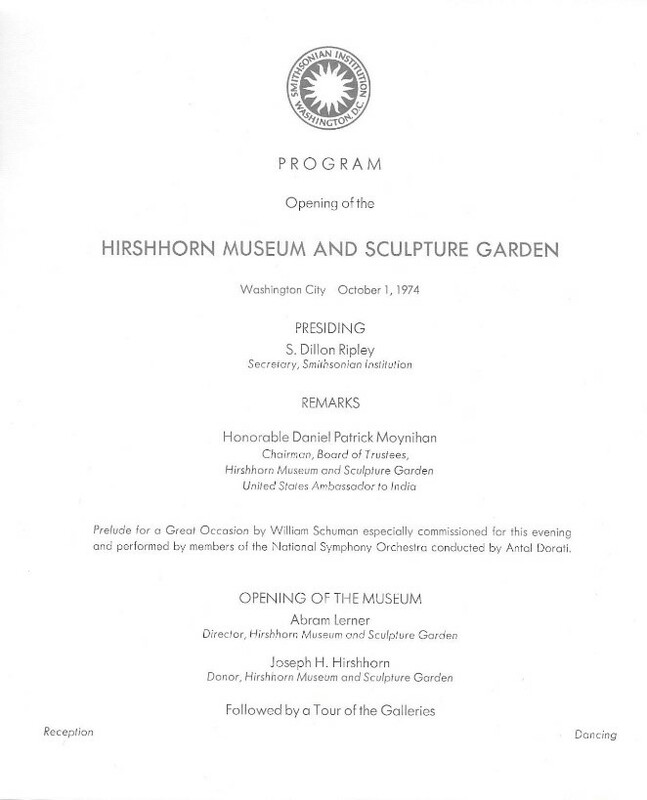 In order to complete an accurate picture of the many facets that go into preparing, designing, constructing, opening, operating and ensuring the successful life of such an edifice as the Hirshhorn Museum and Sculpture Garden: it required an integrated, dedicated staff and certainly the appropriate amount of resources, financial and otherwise to bring this to fruition. I was certainly blessed by being surrounded by overqualified, over-achievers – Staff both above me, besides me and under me. Coupled with the fact that Thelma was really my right hand and very supportive, as well as developing into a most “talented artist” in her own right, there was no way that I could have failed to accomplish what I was required to do. The next posting will address my leaving the confines of the Hirshhorn Museum, the Marvelous going away party, as well as leaving behind many of the wonderful friends we cherished at work and the ones that we made along the way, over the past 12 years. The road ahead would bring new challenges, fond memories and even equally great accomplishments. 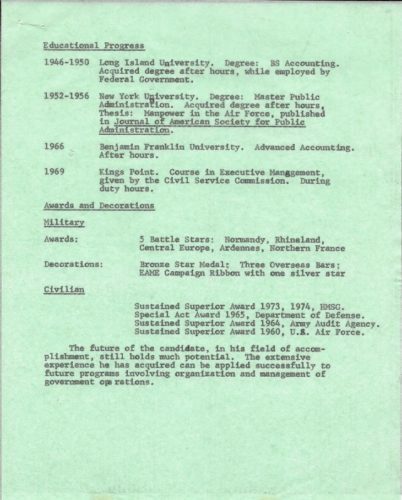 **Appendices and artifacts will include: Detailed budget transactions, congressional submittals, Hirshhorn publications, letters of accommodation from both government level recommendation, letters of appreciation from staff. 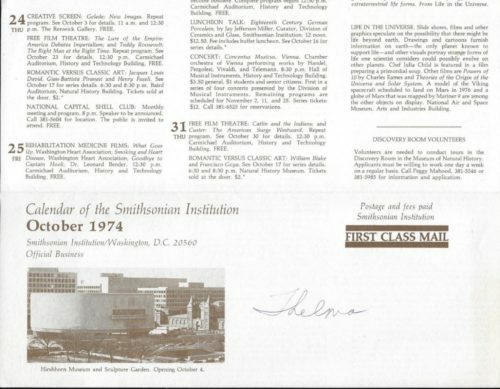 Pictures of the building of the Hirshhorn Museum, opening night festivities, Program, brochures, testimonials, retirement party and farewell address. During this hectic period, I faced a serious challenge. It was early 1974 and I was working like a person with blinders. 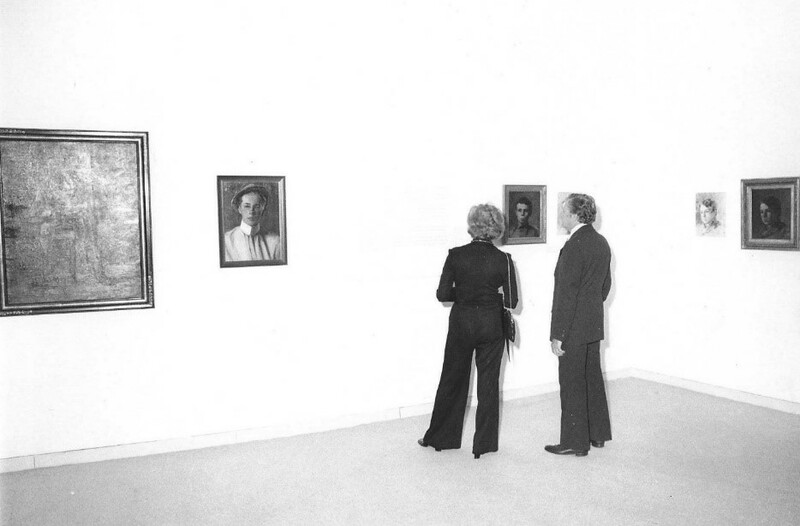 My concentration focused on October 1974 – the scheduled opening. One morning, upon my arrival at the office, Mr. Lerner introduced me to a man about five years younger than my 57 years. He asked me to find space in our temporary quarters and he suggested I keep him busy. This was a strange request in that it was not explained to me what the purpose was for his presence in our office. 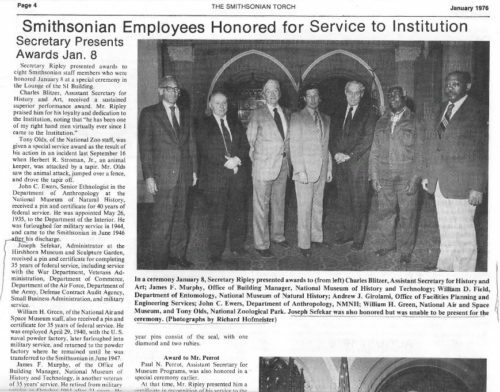 I did know that he worked at the Smithsonian National Museum of History and Technology, and that he was a Grade GS-16 (I was a Grade GS-15). It was apparent he was being “kicked upstairs”. This was a method used to enable an individual to retain a high grade when his ability was in question. I certainly wasn’t going to delegate my responsibilities to an individual who could possibly threaten my position. Since I had not been given direct orders to encourage this encroachment, I decided that I would give him a desk in a secluded part of the office, and assigning him some “make work” tasks that would keep him busy. With nothing tangible for him to do, he realized on his own volition that he did not fit in with our organization. Luckily, this slight interruption did not have a noticeable effect on museum plans, which were progressing steadily toward fruition. 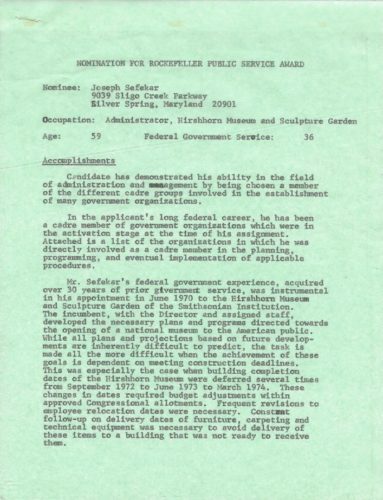 The next day, Mr. Hirshhorn called the Museum, as he was wont to do and inquired as to why we were processing the invoices so swiftly. I explained that the art had been received in good order and the Register had certified that each item was received and that there was no reason to delay payment. When we couldn’t find any reason to withhold payment on the invoice, he felt he had done his best to “negotiate” a lower cost. The invoice was paid promptly. 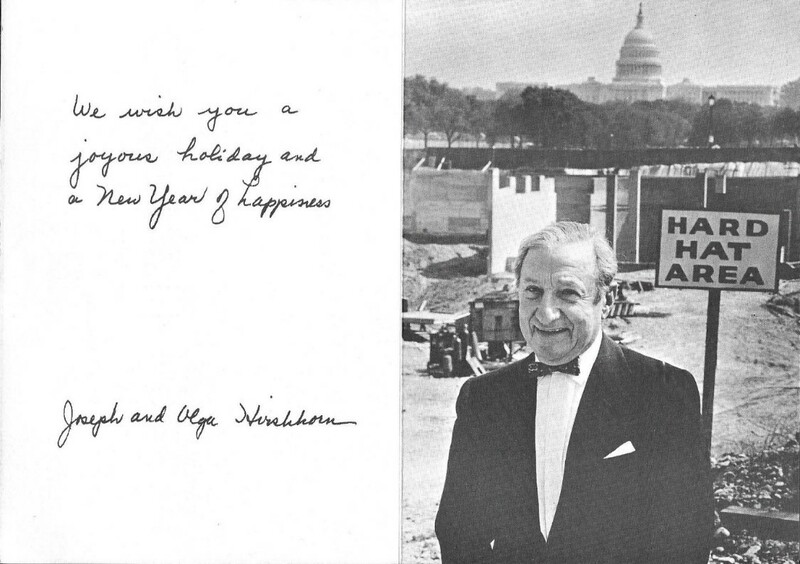 Mr. Hirshhorn was the consummate businessman. And today as can be imagined it’s value is in untold billions of dollars of irreplaceable pieces of art and sculptures under the auspices of the “Museum.” It has indeed found a lasting home among the greatest works of Art on display in the world. I cannot say enough for the opportunity afforded me by the Hirshhorn Museum, the Smithsonian Institution and of course Mr. Joseph Hirshhorn and the experience working under the guidance of Abram Lerner, the Curator. 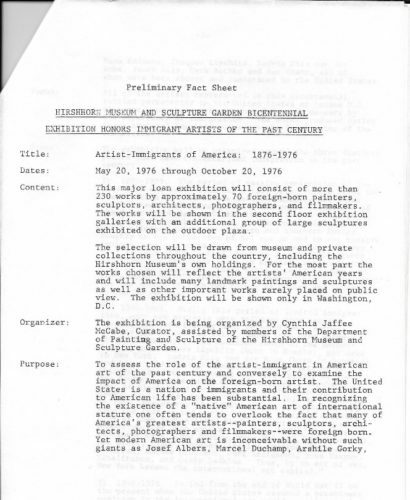 This can be found in the Opening Day Catalog of the Hirshhorn Collection that was presented to the US government. 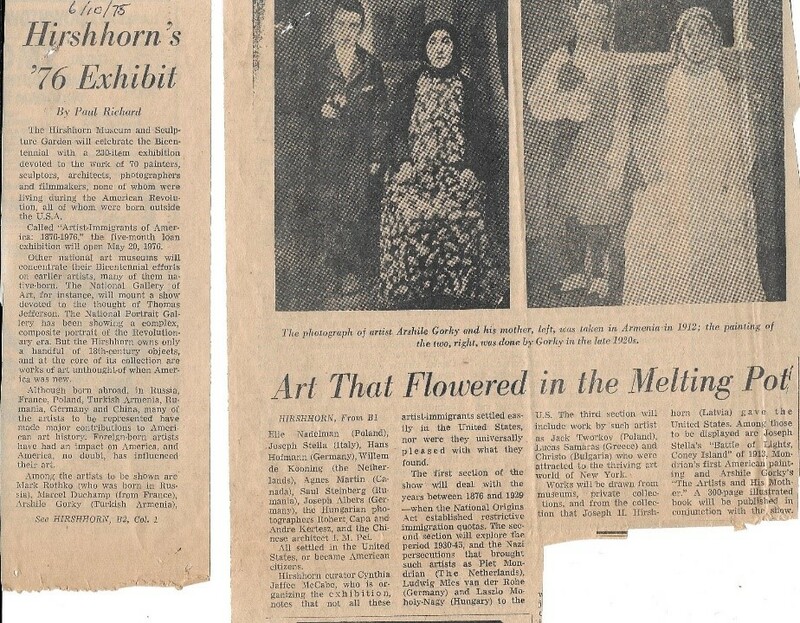 The attached slideshow provides just the thumbnail sketch of what was a lifetime of dedication that Mr. Hirshhorn amassed over 40 years. Enjoy just a sampling and maybe you too might have an opportunity to visit the Hirshhorn Museum and Sculpture Garden, if you haven’t already. 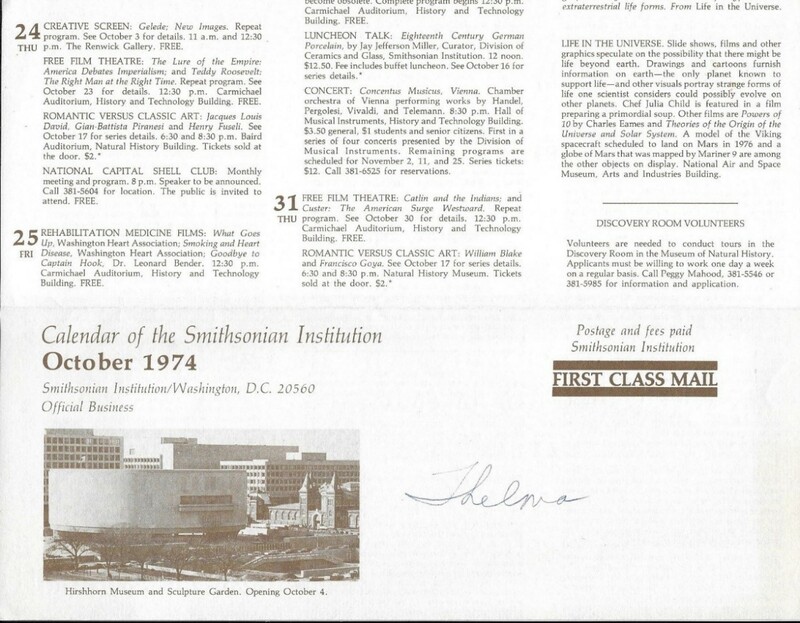 Slideshow of Hirshhorn Collection Catalogue begins now. Tuesday, October 1, 1974, was a mild day, but in anticipation of rain we contracted for a huge tent in the event of inclement weather. Fortunately, we were able to conduct the activities in and around the building without any inconvenience to the guests. 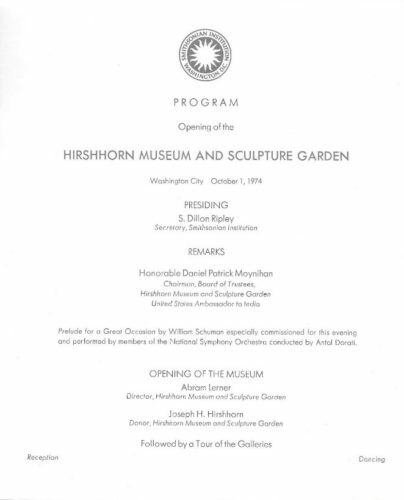 The Invitation to the opening was on a Museum Logo displayed on a platinum border, with a black circle emblazoned off-center on a white globe, symbolizing the Fountain on the circular Plaza and the encircling Building, The invitation invited the guests to the Hirshhorn Museum and Sculpture Garden at Washington City, October 1, 1974. It was a handsome reception with “open” bar and dancing. Mr. and Mrs. Hirshhorn tripped the light fantastic during the festivities. One night was for VIPs and Guests; one night was for the Artists and Guests; and one night for Smithsonian Associates, Employees and Guests. It was three nights to remember, a fitting finale to four years of planning, participation, and the satisfaction felt by each individual involved in this historic endeavor. In early 1975 we were in a sort of shakedown period. All the normal wrinkles in a new building had to be ironed out. The Director wanted a bookshop with educational materials. He steered away from gadgets that weren’t related to the learning process. The staff was involved in developing a long-range schedule of various exhibitions, usually three or four years into the future. This required planning the layout of the exhibition by the curators, exhibition specialists, and historians. Not all items exhibited came from the Hirshhorn collection. A major Retrospective could encompass the best works by a particular artist, i.e., Willem De Kooning, Henry Moore; or selected works of other great collectors, i.e. Sloan Collection. 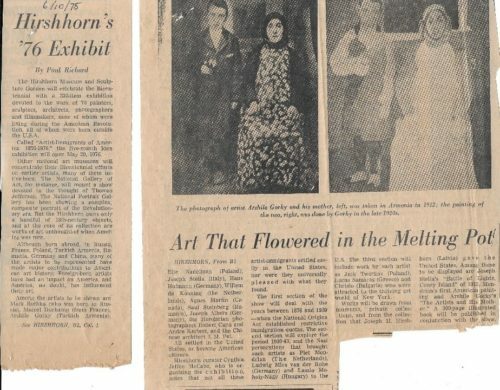 This meant that such art works, supplementing Hirshhorn’s collection would be shipped to the Museum and the cost of shipping, ensuring installing the exhibition would have to be considered in the overall cost. Each exhibition would go through the same steps, and close attention would be given to the current budget costs, and then estimating costs for exhibitions planned three or four years ahead. This planning required the skills of many people, but the Administrator brought the different efforts together into a logical pattern. The past six years were full of challenges, new learning experiences, and the need for numerous decisions. The Museum had its share of critics as well as champions. 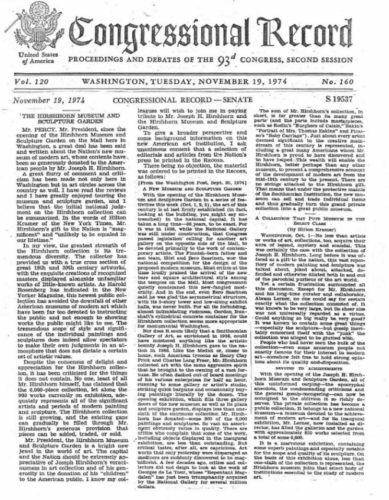 One of the challenges we faced was a review of the Smithsonian Institution, the first in the 126 years that the Smithsonian had been in operation. 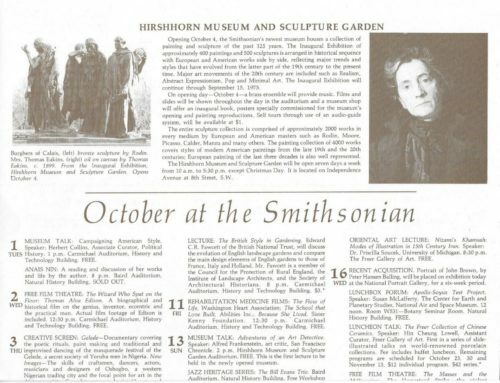 That was a lot of ground to cover, and the Hirshhorn being part of the Smithsonian came in for a lot of examination. 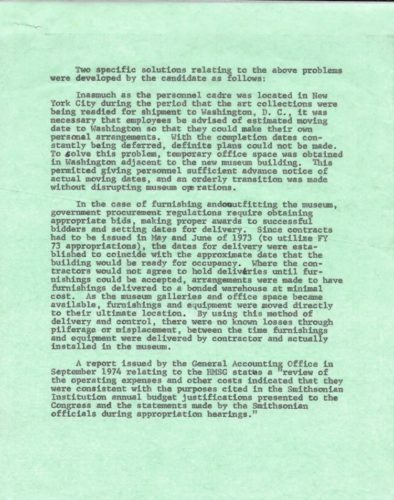 We were particularly involved because one of our critics had been snooping around the different Smithsonian offices, had lifted material from the different “in” and “out” correspondence boxes, and then he would write to the different Congressional Committees, spewing ambiguous information. 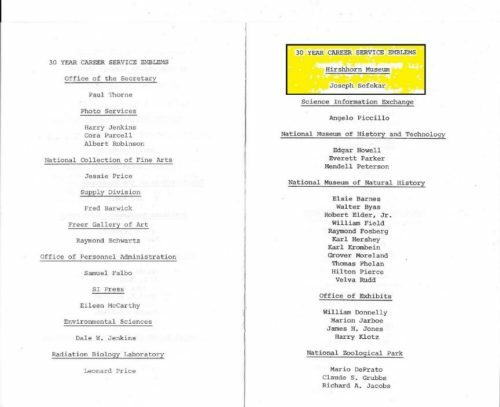 One of these Committees (reviewing the Smithsonian budget) was interested in the activities of the Smithsonian and the Hirshhorn. We had to justify why the Smithsonian needed the Hirshhorn Museum when there were already established a National Collection of Fine Arts and a National Portrait Gallery in Washington. One of my most memorable Hirshhorn Collection memorabilia from the Opening Night Festivities is a signed, numbered poster for the event. It is hanging in a special place in our home. The simple answer was that the Hirshhorn Collection was more in the genre of modern art and its collection of sculptures covers the works of Rodin, Henry Moore and modernists like Alexander. 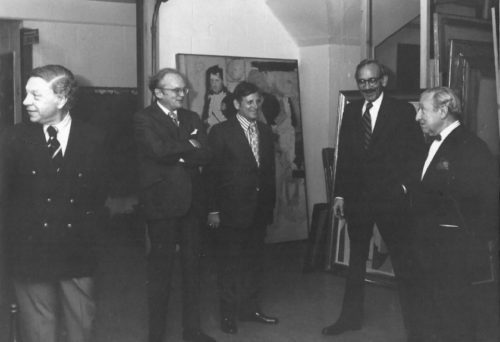 The initial value of the Collection in 1969 was $75,000,000. In 1975 the Collection as estimated at $125,000,000. 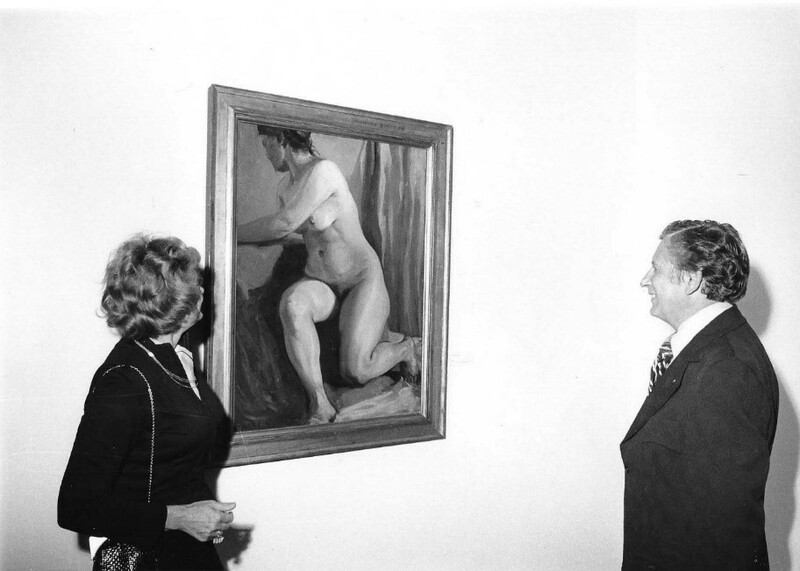 The Director of the Art Institute of Chicago had, at one time, entertained doubts about the validity of the Hirshhorn Collection. 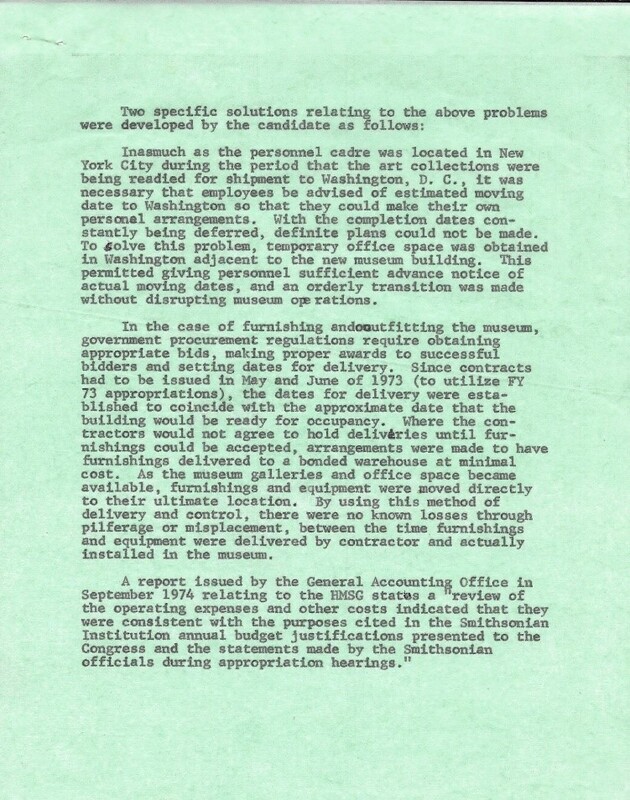 As was the practice in Washington, there evolved from the inspection of the Smithsonian, a request to the General Accounting Office (the watchdog of the Congress) to inspect and issue a report to the Senate by August 4, 1974. A report was subsequently issued which covered such subjects as: Was the Smithsonian empowered to enter into an agreement with Hirshhorn, committing the United States government. 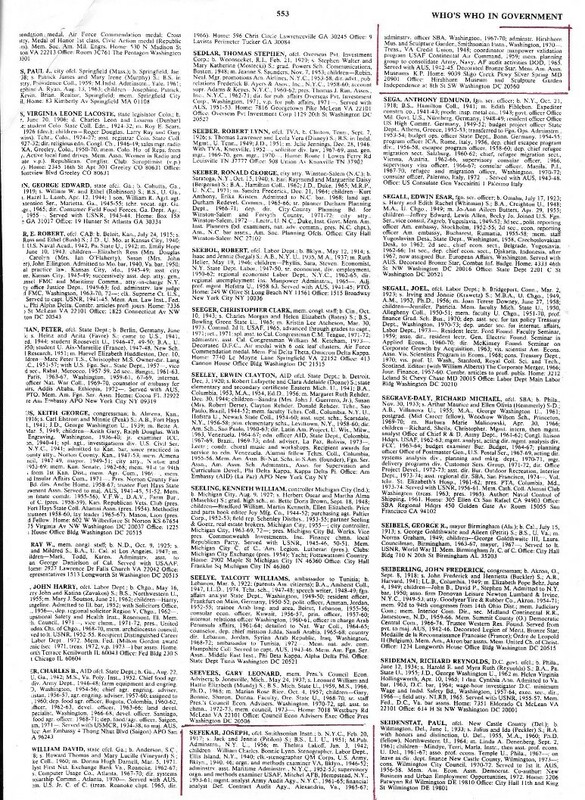 To accepting the Collection; What were the 10 original employees doing for 4 years (1970-1974) working in New York and Washington, to justify the time spent in storing, selecting and preserving the works of art in the “Collection.” Well, the final report was issued, all pertinent questions answered, and the Chairman of the Board of Trustees, Sen. Daniel P. Moynihan said it was the first report he had seen where the General Accounting Office was satisfied with all aspects of their investigation (**include budget reports). 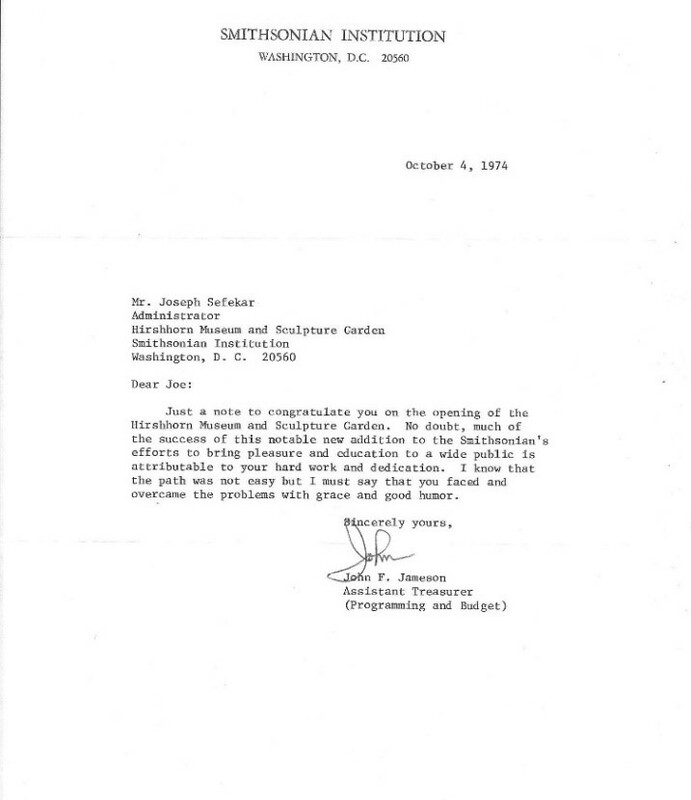 Just prior to the opening of the Museum, Mr. Lerner selected a Deputy Director as his assistant. I had enjoyed my relation with Mr. Lerner, being in a de facto assistant position; I did not feel that this action belittled my job. Mr. Stephen Weil was a lawyer and former Director of a Museum in New York. 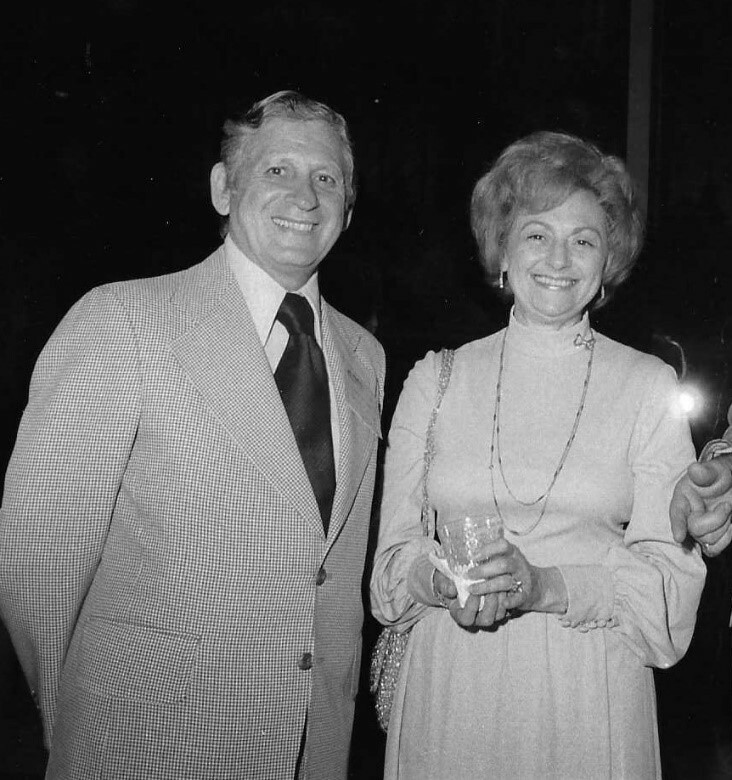 The Hirshhorn Museum was entitled to a Director and Deputy Director. Mr. Lerner treated me well, awarding me several with-in grade promotions, which provide in-grade increments. Weil was a take hold individual, but Mr. Lerner kept him in check. In a public relations interview, Weil said he “believed in rocking the boat.” I’m a great believer in holding on to the “gun wale”. Weil’s first efforts were to try to replace several division chiefs – I quickly derailed such plans. He got involved in certain personnel problems and, in one case, we disagreed on a decision and he threatened to throw me through a window. That didn’t bother me except we were on the fourth floor. We defused the situation, and got along pretty well after that. However, at this point, I began thinking that this is a good time to make my departure. Everything was fine, salary was great, had no enemies – I could leave in a good frame of mind. However, this would not be the case for the immediate future. As indicated, the challenges of keeping the Museum functional and in smooth working order would require even more vigilance. I was surely up to the task as will be seen in the next part of the “Hirshhorn Accomplishment.” And so ends the third of four parts for Chapter 9’s posting. 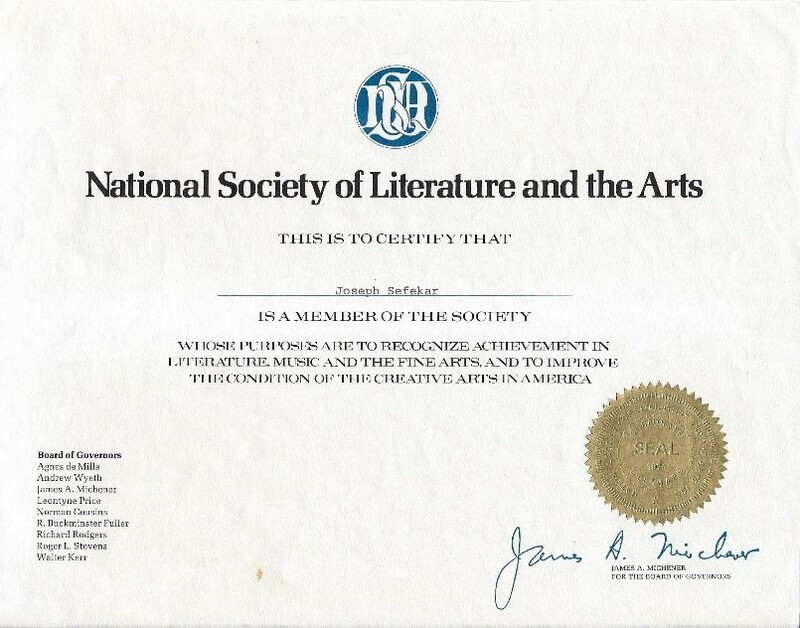 **Included will be many of the memorandums and letters to the Smithsonian and budget preparation. 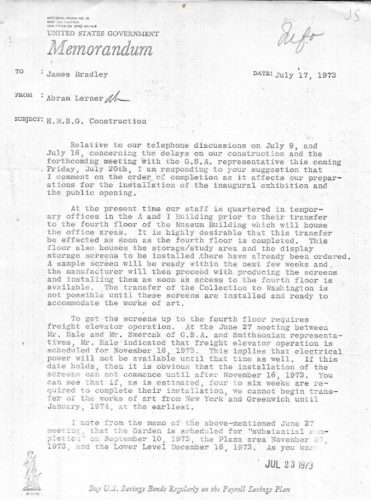 Correspondence with Al Lerner, Joe and Olga Hirshhorn and of course the myriad of pictures, diagrams, communications and documents that went into building the museum. During this period an equally rewarding event took place in our family’s life. It just happened to be the preparation and wedding of my dearest daughter Bonnie Lynn Sefekar to a most worthy young man, Lee Elliott Landau on Saturday, August 3, 1974. 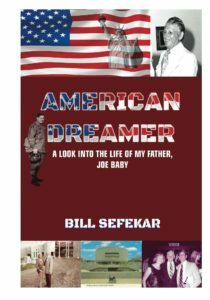 It will also mention Bill Sefekar’s running for the Maryland State Legislature in the 1974 Democratic primary. Mondays, the staff eagerly awaited my report. On the Fridays I spent in Washington, I would follow-up on purchase orders for equipment and confer on personnel actions in progress. I would attend conferences with key Smithsonian personnel and meet with the contractor’s representatives. But there was no news for the “troops” in New York. The construction was behind schedule and when they asked, “when are we moving to Washington?”, I would have to say, “We’re behind schedule on the building”. This had an unhappy effect on the staff, who were eagerly awaiting their new assignment, as well as me who was eager to get back to Washington. They were young and waiting to launch their careers – with eyes focused on new horizons. Many of these professionals would make a name for themselves in the not too distant future. But in the meantime they worked feverishly, going about their business of preparing the collection for its transporting up to Washington DC, when the Museum was ready to receive these precious gifts. I found it rather amusing and entertaining to see how the staff painstakingly managed to have pictures made, I should say miniaturized pictures of the entire collection of paintings and sculptures. 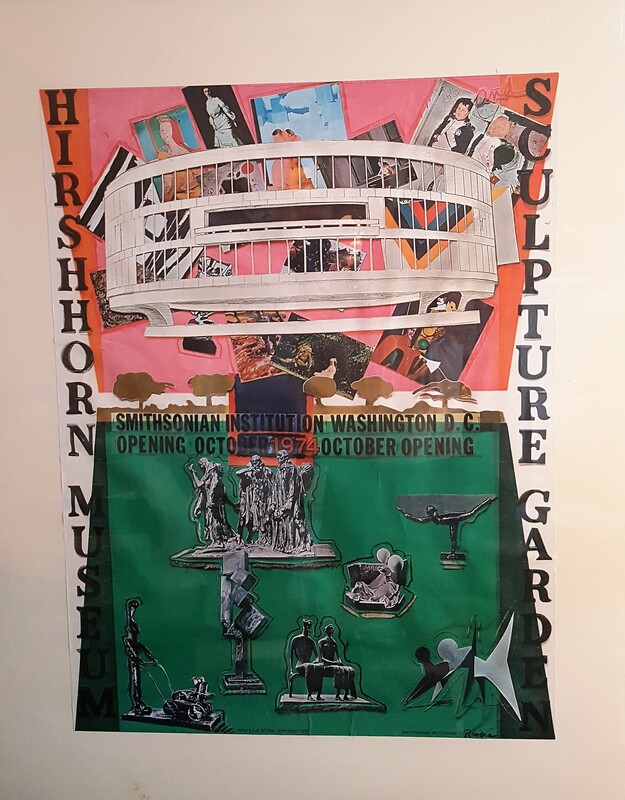 This is all done to scale and to be part of an 11 foot replica model of the Hirshhorn Museum and Sculpture Garden. It was a cutaway version that lent itself to the staff of art experts to prepare the layout for the opening exhibits and beyond. These little miniature paintings and sculptures were interchangeable as the three-story Hirshhorn Museum was retractable to accommodate placing the artworks in the most desirable arrangements. But for now, their futures were on hold – they had to pick up their lives here and move lock, stock, and barrel to new surroundings. Some had families and had to take care of schooling needs; some of them had to transfer their bank accounts, and establish their credit in their newly adopted state. On the other hand, I was the stranger in their midst, and they thought I was keeping the truth from them. But I really was a straight shooter and was very concerned about their adjustment when reaching Washington upon completion of the construction. As a result of setting a good foundation, many continued their careers well into the 21st century. A very interesting off-shot did occur. While I was becoming engrossed in the finer parts of the fine arts, Thelma was becoming immersed in the actual art of the fine arts. She actually began taking painting classes. The classes only supplemented a special gift that she had, just waiting to be released. She created many remarkable works that the family is quite proud of, and not just our immediate family. It was also a part of my extended family, coinciding with the Hirshhorn experience. We will have a gallery exhibit of sorts that we’ll show later on to give Thelma her just due and you can judge for yourself. One was even an abstract of the Hirshhorn Museum. But back to the task at hand: BUILDING THE BUILDING!! That’s when I found that contractors were always two or three years late. Even with a penalty clause of $ 1,000 a day for each day behind schedule did not expedite the status quo. At the completion of the construction; the penalty stood at $700,000 which was later adjusted by arbitration. 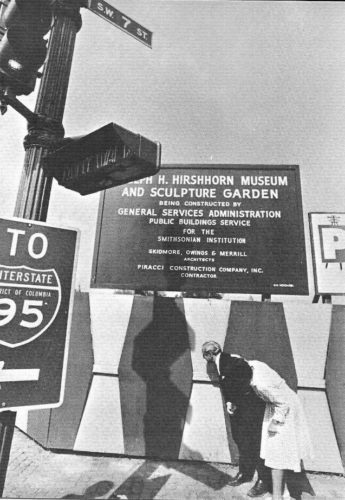 In 1972, Hirshhorn’s agreement had to be amended to meet completion of construction. Figure#9-10 Board Meeting, Morgan Warehouse, 510 W.21st, St, N.Y.C. 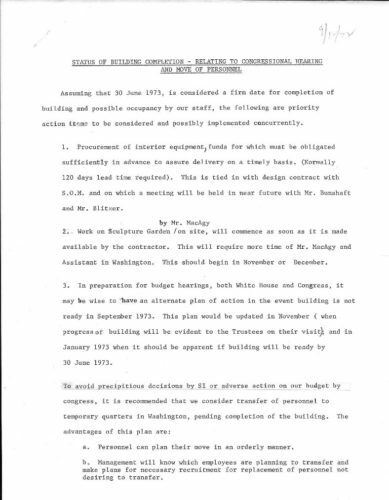 One of the fateful Board Meetings held in 1972 that would be going over the staff preparation for the move to Washington and dealing with the scheduled construction delays. 1972 marked another milestone in my career fulfillments. It marked the 30th anniversary of my service with the Federal government that began in 1942 with my induction into the Armed Forces. 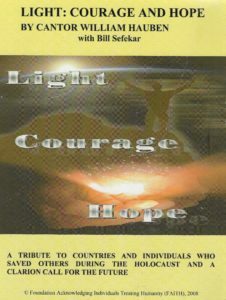 My wife and children took part in this Special Program. I would serve another 5 years before retiring in 1977. 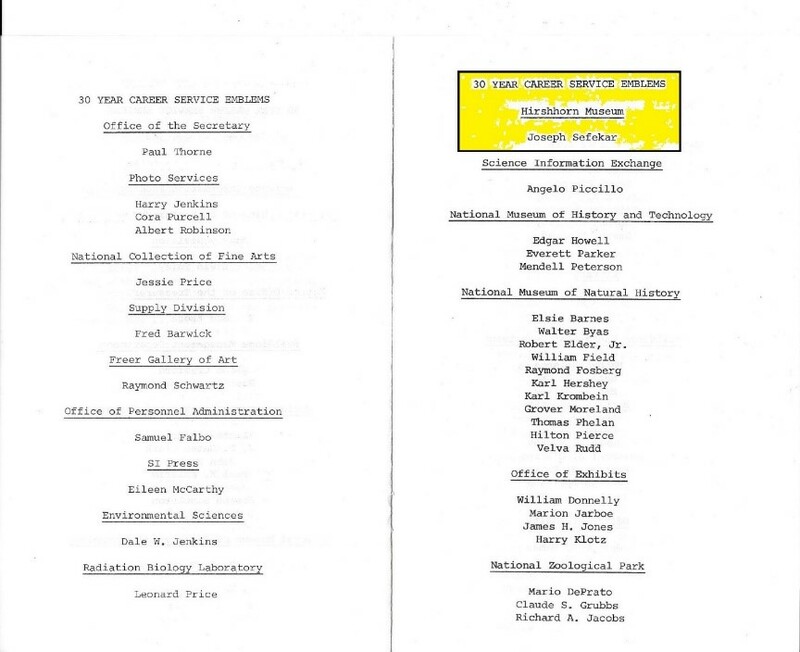 Figure # 9-11 Smithsonian Honor Awards; 30 Year Career Service. With this special milestone behind me there was nothing more I could do but make sure that my career continued to a successful conclusion and I continued to immerse myself even more fastidiously into working with the officials at the Smithsonian, my higher-ups at the Hirshhorn and my staff. I was very dedicated to them and had developed a deep seeded attachment with them. 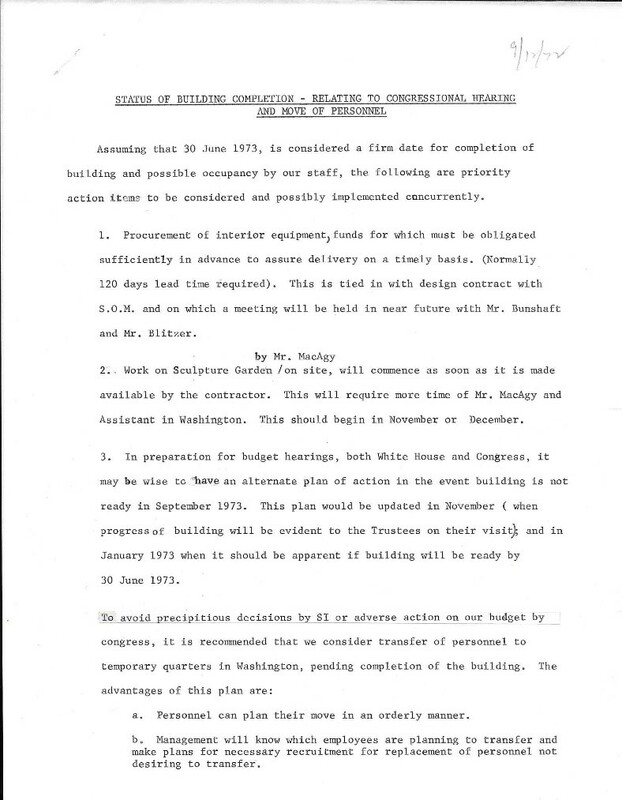 This Memo spelled out the requirements that would have to be in place before, during, and after the transfer of the collection to Washington is made. 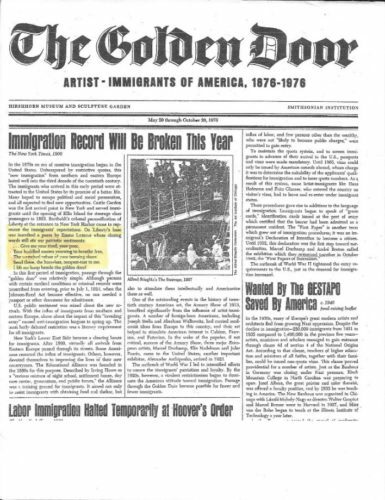 Time frame dates for completion included: The Garden, September 10, 1973; freight elevator, November 16, 1973; the Plaza area, November 27, 1973 and the Lower Level, December 16, 1973. Making the transfer of the Collections beginning at the earliest until January, 1974. The 1972 – 73 period brought many changes to our family. Thelma and I had made many enduring friends not only at Parkside Plaza but in the Silver Spring Maryland area during the past six years. We received visits periodically from our family up north in the New York area. Billy staked out his claim in the political arena, chasing his idealistic pursuits. He continued his association with the Democratic party and worked at the Democratic National Committee (DNC) in the radio department; located in the legendary Watergate building in Washington DC. In 1972 Sen. George McGovern became the Democratic Presidential nominee and selected Sargent Shriver as his vice presidential running mate. Sargent Shriver, was the initial Director of the Peace Corps among his other attributes. Billy was assigned to travel with the Candidate. For two months he crisscrossed the country attending numerous political gatherings and events; flying in and out of National Airport in Washington. On one such trip we picked him up at the airport for his usual one-day layover, to be off again after getting fresh clothes. 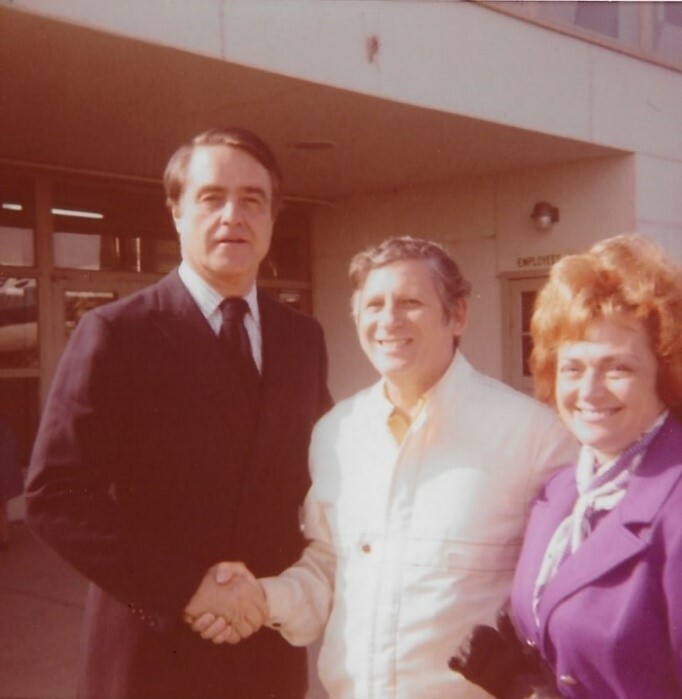 It was a special happenstance that we happened to meet Sargent Shriver while he was debarking from the plane on the Campaign Trail. Bonnie on the other hand was taking a more serious path. One of her friends from high school thought it would be a good idea to fix her up with one of the fellows that she knew from high school while attending Montgomery Blair. It was sort of a blind date and as fate would have it Bonnie would meet him occasionally during the next few years, while attending the University of Maryland. The young man, Lee Landau who had ideas of becoming a lawyer and joining his dad in his practice, began the courtship in earnest in 1972. Their relationship would blossom with this fine fellow setting his sights on taking my daughter away, literally and figuratively. But it was one of the most wonderful things that could have happened to my family and my daughter. Figure #9-16 Meeting Vice-Presidential Candidate Sargent Shriver. Mr. Lerner thought it appropriate in considering all my effort put forth during the last three years that I receive a “Nomination for Quality Step Increase.” In the justification for the step increase it was stated in some very glowing terms that I still feel exceptionally proud of even to this day. Having been called upon in my present position as Administrative Officer to perform a wide range of duties, and in all these having showed excellent ability. 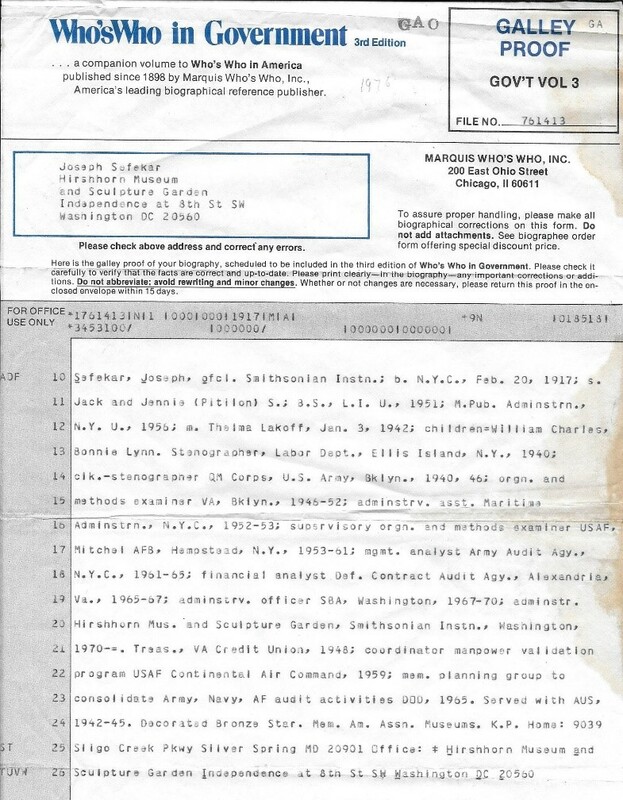 In addition, Mr. Sefekar shown an unusual ability to meet any and all requirements of his position. He has shown great resourcefulness, initiative and industry and handling his various work assignments. His work performance has consistently exceeded normal performance expectations, and his excellence of achievement and spirit of cooperation have contributed significantly to the successful accomplishment of our mission during the past three years. And thus I was awarded a Quality Step Increase. 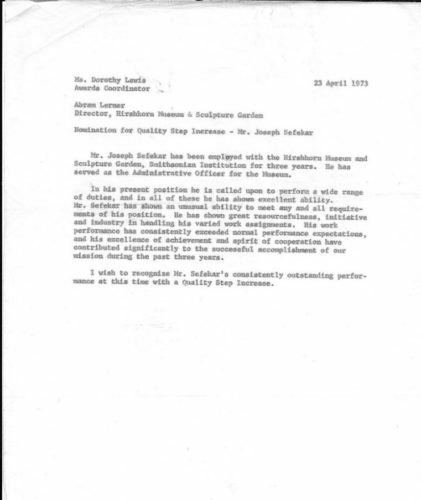 Figure #9-17 Nomination for Quality Step Increase dated April 23, 1973. 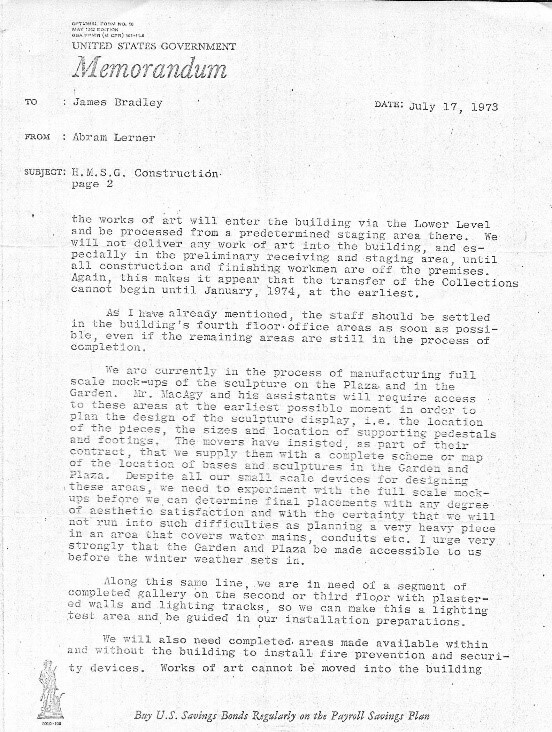 As is my usual penchant for taking copious notes about events that took place, my files were filled with some of the details that occurred during the course of the construction and preparation of the Museum. 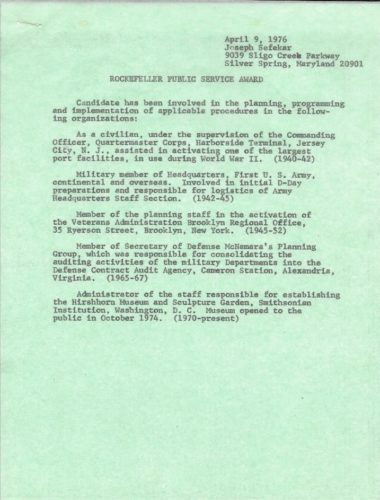 In May, 1973 the following are excerpts (hand-written notes, surfaced) from some of the day-to-day activities that took place during the week of May 23 and the myriad of details and decisions that had to be made. May 23 – Rowan–Weiner conference RE: ektachrome (old camera film scanning) for postcards. 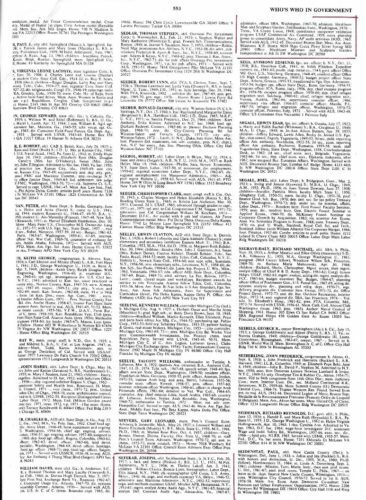 May 24 – Washington – interviewed Baird – Administrative Position- VG. Held meeting with Barwick on requisition – some resistance to drape requisition, may run into trouble. 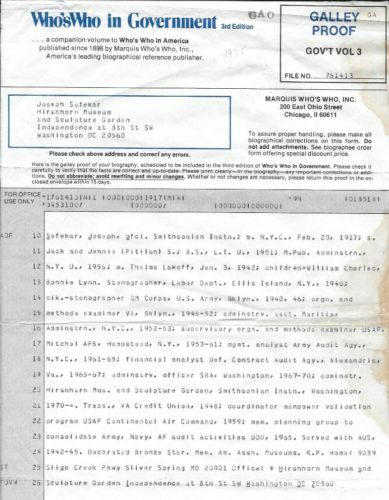 May 25 – interviewed Dr. Albert – interested in research or curatorial position, VG interviewed Mr. Marsh – Exhibits Displays – G. Trouble with requisition for special equipment which Mr. Blitzer must sign. He left for weekend without signing. Set up meetings with Tele sonic on Friday, June 1 to demonstrate Tour Guide System. Set up meeting for Thursday, May 31 to discuss filming history of HMSG. Final portion of 1,000 data collection sheets submitted to Information Services Division. Arranged special keypunch and verifying. May 29 – All day loading by Morgan Bros. Manhattan – All library books and file cabinets. McCabe moved, Rosensweig, Brooks scheduled end of week. Meanwhile routine work goes on. 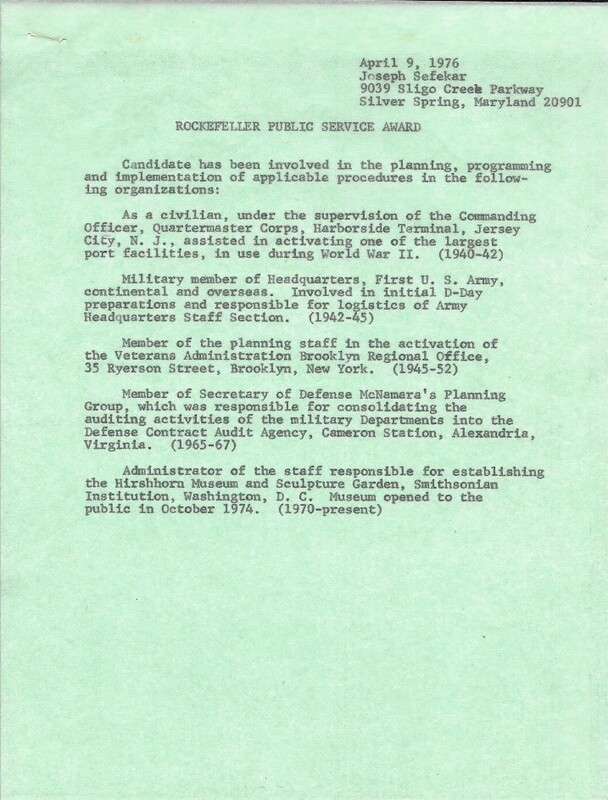 Revised plans to return to Washington to receive books – will leave up to staff in Washington. May 30 – Visited Warehouse in morning to advise staff of status of office operations and to inform Nancy Sage, et al., that move of collection our priority item and that Mr. Lerner and my efforts will be directed towards that end. Contract will be signed with movers in next few days. However, other major items which are routine: continue procurement of Museum furnishings, will require full time between now and June 30. Our aim is to stay within procurement regulations without holding up requisitions and purchase orders. But we will try to furnish on this information to Supply Division, S.I. An historical meeting took place on Wednesday, January 10, 1973 at 820 Park Ave., New York City. 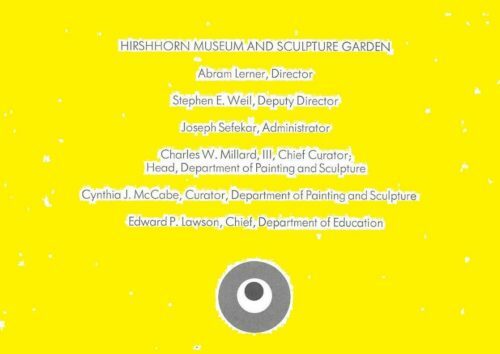 Our staff, Mr. Lerner, Miss Sage and myself went to Mr. Hirshhorn’s apartment to beard the lion in his den. Our mission was to get JHH’s okay to begin plans for moving his collection to Washington, DC. 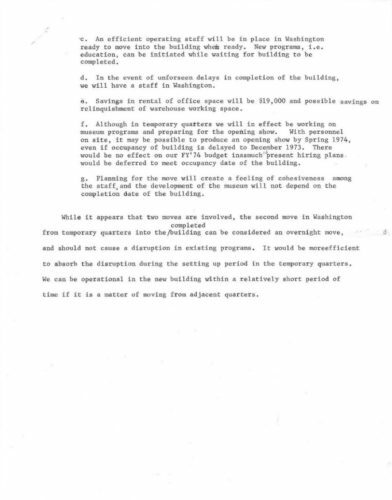 This was a sort of re-start up because the original estimates we had solicited initially were in November 1971. With the delays in the building completion, the proposed move was put on the back burner. Now, the feeling was that this was the time. 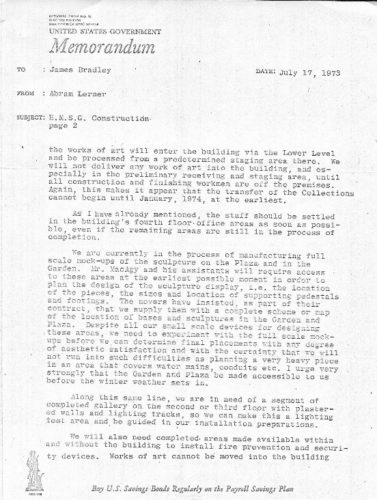 Again, the first reaction by Mr. JHH was “it was too soon.” The problem facing us was having completed and secured the building to receive the collection. Workmen should be out of the building and all possible impediments be removed. We agreed we should plan an October receiving date, and on that basis we convinced Mr. H. that we needed a minimum of nine months lead time – six months for packing and crating and three months for moving. This made the month of February as the target date for signing a moving contract. Mr. H gave us the go ahead sign – we agreed on the most likely of movers to be selected. Over a drink, and some arty talk, Mr. Lerner came up with an anecdote. When Mr. H. was visiting Picasso he made the unpardonable faux pas of offering Picasso money for a sculpture. Sensing Picasso’s reaction, Mr. H. adroitly changed his approach by saying “I’ll give everything I have,” taking off his bowtie, his jacket and two francs. Picasso asked “will you throw in your wife,” to which Mr. H. said “yes.” Picasso laughed heartily, said “he’s crazy” and took the bow tie and jacket. Mr. H. got his sculpture. 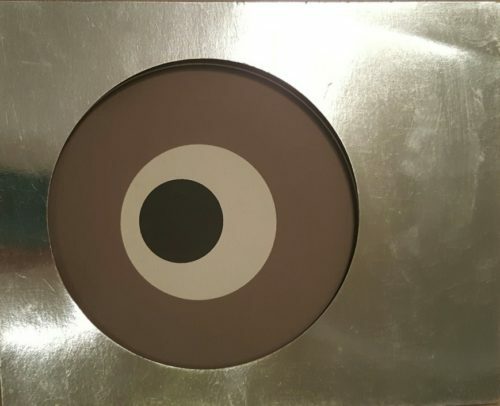 During our conversation, the discussion arose on locating a few items that are listed in the Hirshhorn collection but have been in apparently misplaced. It developed that a painting was found hanging in Mrs. H. boudoir. She was reluctant to give it up since Mr. H. had given it to her as a wedding present. Mr. H. said “don’t worry my dear, I’ll replace it.” It was done in all humility, without any petulance. 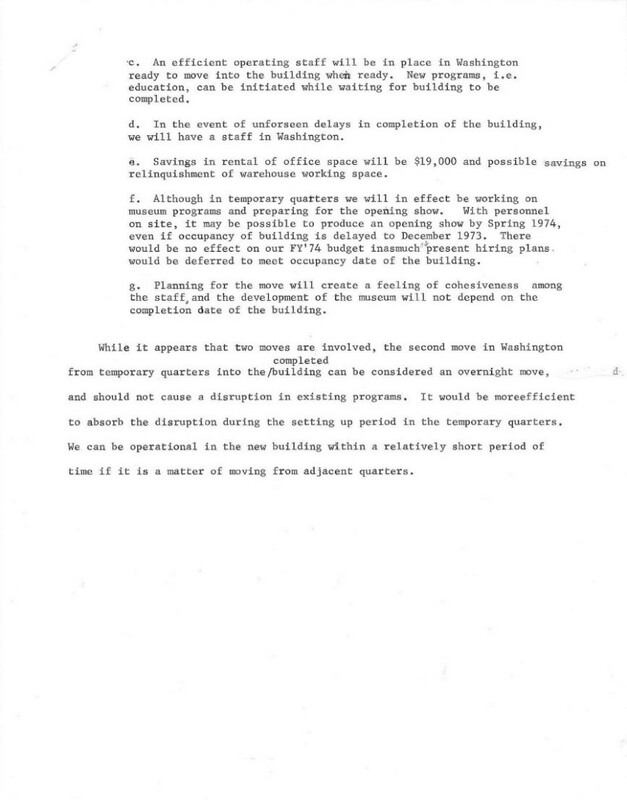 Figure #9-18 of the Opening of the Temporary Offices at the Smithsonian and closing of the New York Office. This made it essential that the contact for a qualified mover be let, adhering to government regulations which required unquestioned professional ability in transporting art and other valuable objects, safely and undamaged. 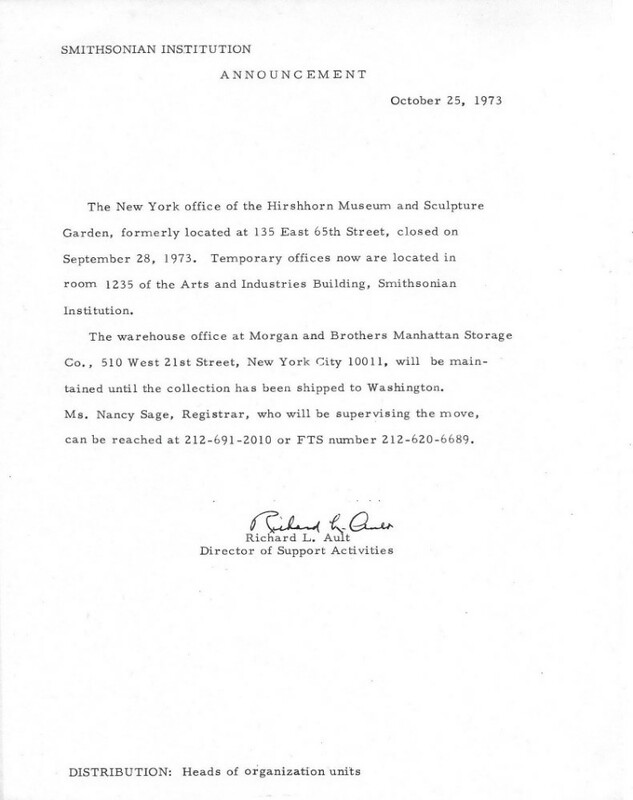 As a sign that we were progressing towards completion of our hiatus in New York, The October 25, 1973 Announcement stated that the New York office of the Hirshhorn Museum and sculpture Garden located at 135 E. 35th St. would finally close on September 28, 1973 and that temporary offices would now be located in room 1235 of the Arts and Industry Building, Smithsonian Institution. The Warehouse Office at Morgan Brothers and Storage Company 510 W. 21st St., New York City would be maintained until the Collection is shipped to Washington. This was the signal we were looking for, coming to fruition after many years and so many hours that our staff was inching ever so close to seeing the dream become a reality. End of Part Two of Chapter 9, The Hirshhorn Accomplishment.” In the next Blog posting, Part three of this 4 part Series, will deal with what would amount to the most providential calling that I would have in my lifetime: The “Opening of the Hirshhorn Museum.” It would be slated for October 1, 1974; a year from now. The next digression takes place as a result of some minor surgery that I had at the Holy Cross Hospital in Silver Spring Maryland. I am not predisposed to being a good patient as was recently retold by my incident at Sloan-Kettering Cancer Institute New York; saving the nurse who had fainted in my room. I was in a bad state of mind while recuperating at The Holy Cross Hospital. Unbeknownst to me, my son and a good friend of his, Bill Reinckens who grew up in a Catholic family in Yonkers, New York contrived to pick up my spirits. They just happened to come across one of the famous Marlene Dietrich’s poster of her with her parasol from the movie Blue Angel. 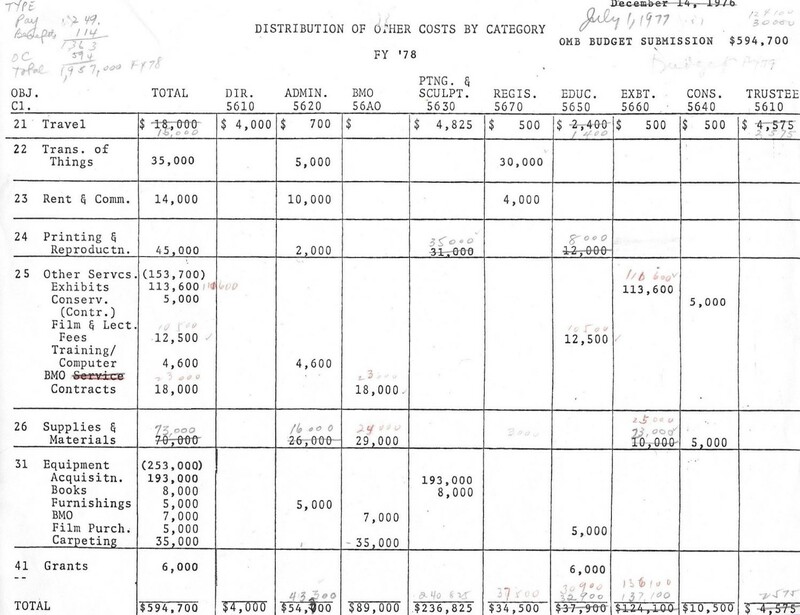 Who during the war years in the second World War coincided by way of my involvement with the USO. 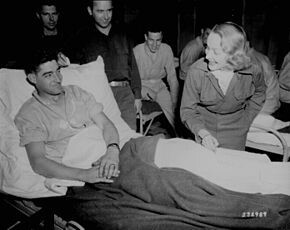 Miss Dietrich had entertained the troops and there were some pictures in my war album of her with the first Army Headquarters, rear echelon. A couple of these pictures with her and Mickey Rooney appear in Chapter 4; The War Years. Well if you could imagine my son’s friend in his druid outfit complete with hood from his choir days in New York and a red yarmulke presented to him by my son marched into Holy Cross Hospital beside pictures of Pope Paul the sixth in his red outfit and skull cap, “yarmulke.” They could have passed as emissaries from the Vatican and proceeded with their poster of Marlene Dietrich which they presented to the nurse as they entered my room. Unrolling the poster, they showed the signed copy that professed, “To ‘Joe baby’ (see previous chapter 7 derivation of nickname) get well quick so we can pick up where we left off”, signed Marlene. Naturally it was quite an uplift. The nurses were in an uproar and they proceeded to scotch tape the poster to my hospital room wall. Everyone seemed to enjoy this little bit of ribaldry except when my wife came into the room to find out that Marlene had added her get well soon wishes that seemed to steal the show as she did 30 years ago. With that behind me, I returned to my government work and possible new career assignments. As mentioned earlier in this chapter my fortunes took an upturn with my contact at the Small Business Administration which was duly noted. 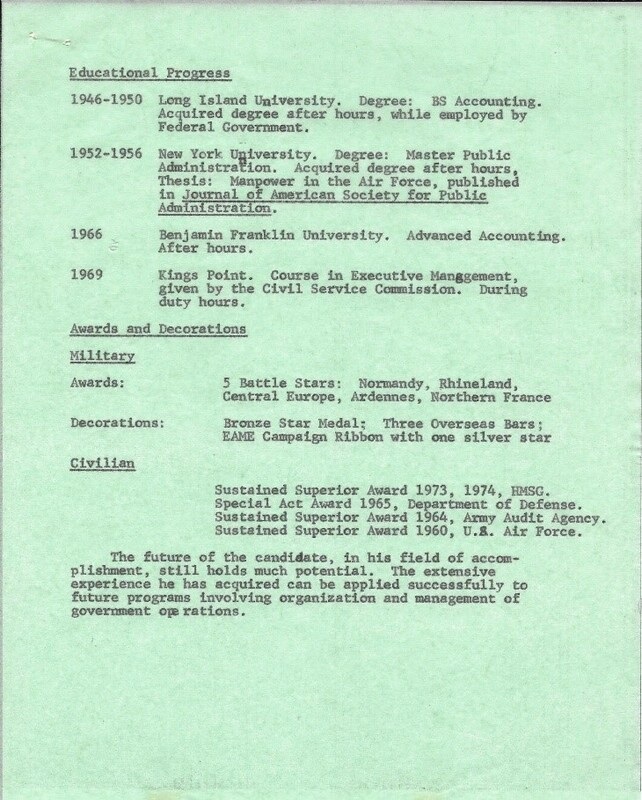 Through the auspices of Ethel Maness, it turned out that her husband, Irving, was the Director of the Management Assistance Division at the SBA, so she had mentioned to Bill that there was a position available for Budget Officer for which the SBA was currently recruiting. When I was interviewed, I said that I was being considered for another position, not intending to give the impression that I had other alternatives. He said “Joe, who are you kidding – you know you don’t have other offers.” He was right, but I got the job. During my stint with the Small Business Administration (SBA), I was an assistant to the Administrative Officer, Morton Oppenheim, who didn’t like to do budgets. We turned out to be the best of friends. Our business relations grew into a personnel bond that was to continue for a long time. 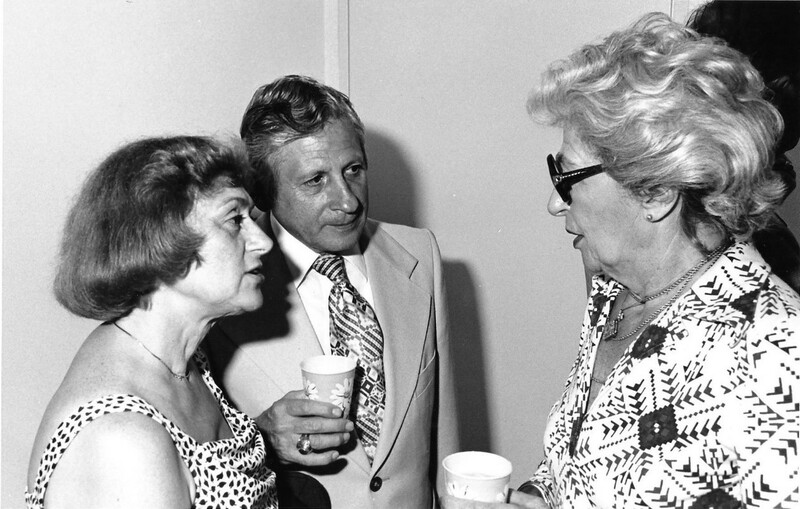 Edith Oppenheim, Morty’s wife and Thelma became fast friends. Mr. Oppenheim, my supervisor, had a Secretary who was a nice, middle-aged woman. She also performed secretarial duties for me. I thought our dealings were pleasant, and I thought that I had not made any abnormal demands of her. But we never know what people really think of us. One day she exploded and accused me of being a “Little Caesar”. Nothing serious came of this outburst, but thereafter at home, I was “hailed” as “Little Caesar” ala Edward G. Robinson, and my wife took delight in taking me down a peg, if I ever puffed up with authority. I considered this one of my better positions, although I was happy with most of my other jobs. Mr. Maness was a jovial person and politically motivated. He had been part of the battery of lawyers who had been assigned to the Nuremberg Trials in Germany. When the perpetrators of the grizzliest crimes visited upon the human race were brought to justice, he was there. In the presidential election of 1968, there was an electric feeling running thru the government agencies in Washington. It was more so in the Small Business Administration because the SBA was a political football. In every new administration, the chief administrative appointed head at the SBA was always of the ruling party and the division heads were always cronies of the top appointees. 1968 was a crucial election year. The Democrats had big hopes of winning the election and retaining control of Congress. But in June their hopes were dashed when Robert Kennedy a popular candidate for the Presidency was assassinated and his death threw the Democratic Party into confusion and turmoil. 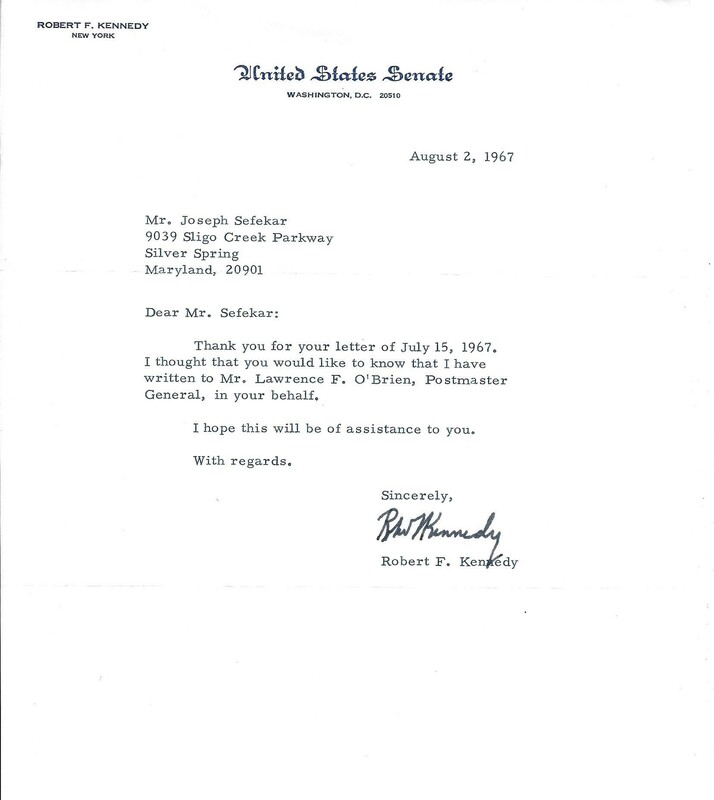 As my usual flair for writing and “sending out feelers,” culminated in a letter I wrote to Sen. Robert Kennedy and the attached letter I received from his office. I hold this very dear in light of what transpired. This appointee was one of his party followers who had been a utilities employee at $ 5,000 per annum, and he received an appointment at a salary of $ 13,000. This wasn’t unusual but it was the influx of appointees who were unaware of governments rules and regulations affecting work rules and limitations covered by the Hatch Act. During this transition period, we came to work one morning and there was a smiling cherubic face, ensconced brightly behind his desk with a cardboard box of buttons – campaign that is. I know that political campaigning is prohibited in Federal buildings, and at one time federal employees could not participate in electioneering and that was the creed I followed. There was a big hullabaloo around that desk. The clerk was admonished and told to remove the box from the desk immediately. He was advised of the harsh penalties for such actions. I wonder if he ever became a permanent civil servant. Things were catapulting in amazing changing scenes of events that seemed out of this world for a young boy/man from the teaming streets of the lower East side and Canarsie, New York. 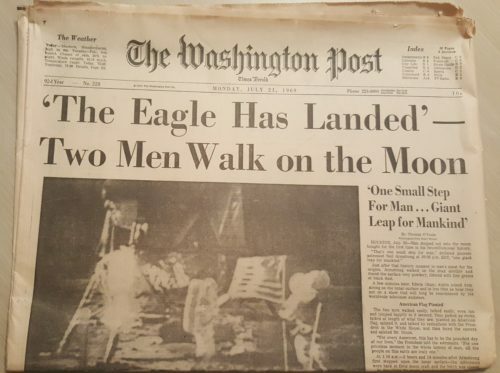 Not only would my world be forever changed shortly but from my “Vault” of newspaper clippings and other things I’ll share with you another Earth-shattering/momentous event. 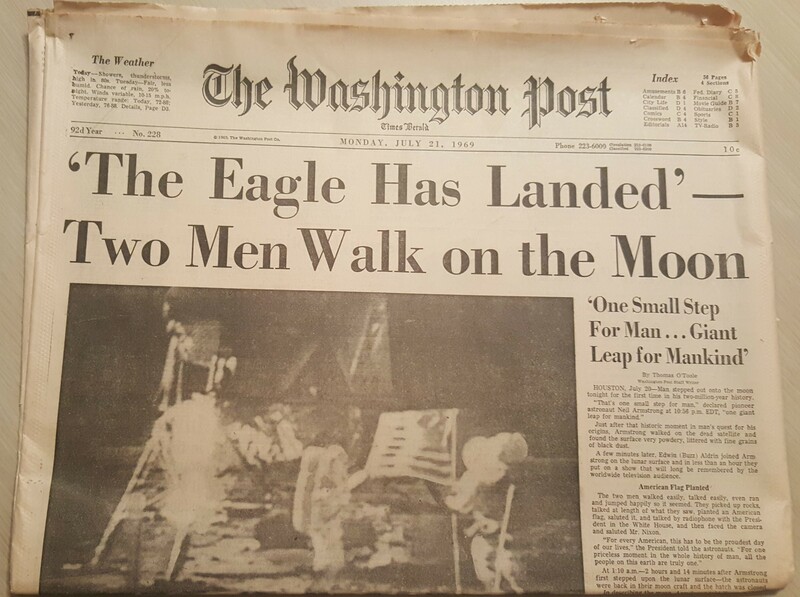 The moon landing of the ‘Eagle,’ July 21, 1969 when Neil Armstrong and Buzz Aldrin planted the American flag on the surface of the moon. “One small step for man… Giant Leap for Mankind.” This was also my giant leap of faith as you will soon see. The other astronaut of this integral triumvirate, Michael Collins, controlled the command module, would become the first Curator of the Air and Space Museum that would open its doors two years after the Hirshhorn Museum for the US Bicentennial in 1976; right next to the Hirshhorn. Author’s Note: Life is full of so many coincidences and unexplained happenings, creating another reason why this book is being written. As part of our regular weekly routine the blog posts are submitted on Saturday for Monday postings. This blog posting was submitted on Saturday, July 2, 2016, to be aired on Monday, July 4. On Sunday, July 3 one of the authors happen to see the just-released movie: “Independence Day, Resurgence.” It created somewhat similar feelings as the first movie exactly 20 years earlier. Yet, it was even more moving and produced a greater profound impact than was expected. 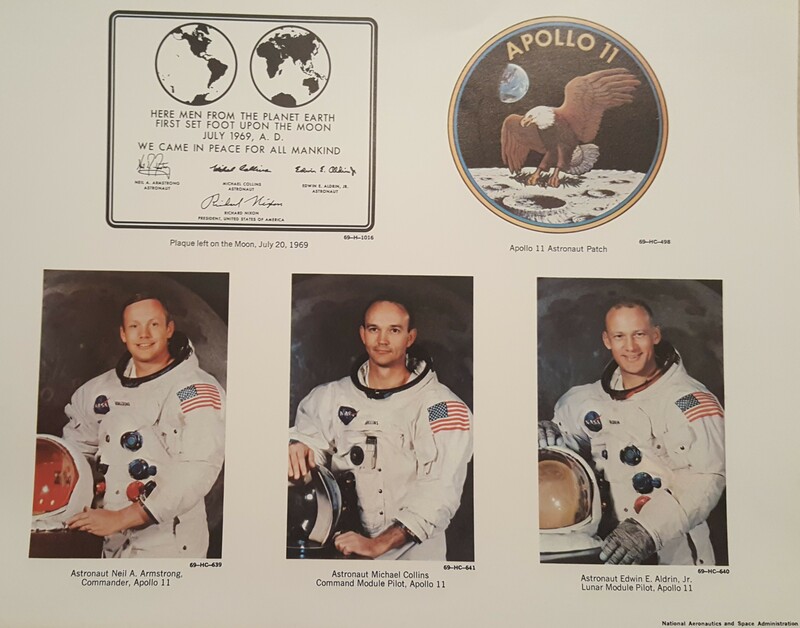 It’s hard to believe that in less than three (3) weeks, the 1st actual manned moon landing will have taken place 47 years ago. The movie even shows a colony established on the moon and how it might look; one day! The movie projects a lot of family interactions, ties that bind parent-child and bonding friendships with the main storyline showing all of the nations on the planet working together to defeat the out of space adversary. And another curious byline was that the President of the United States happened to be a woman. Do do do do do do. There are many things we all need to ponder over as we speed thru space: our values, ideals, principles, fate and faith. 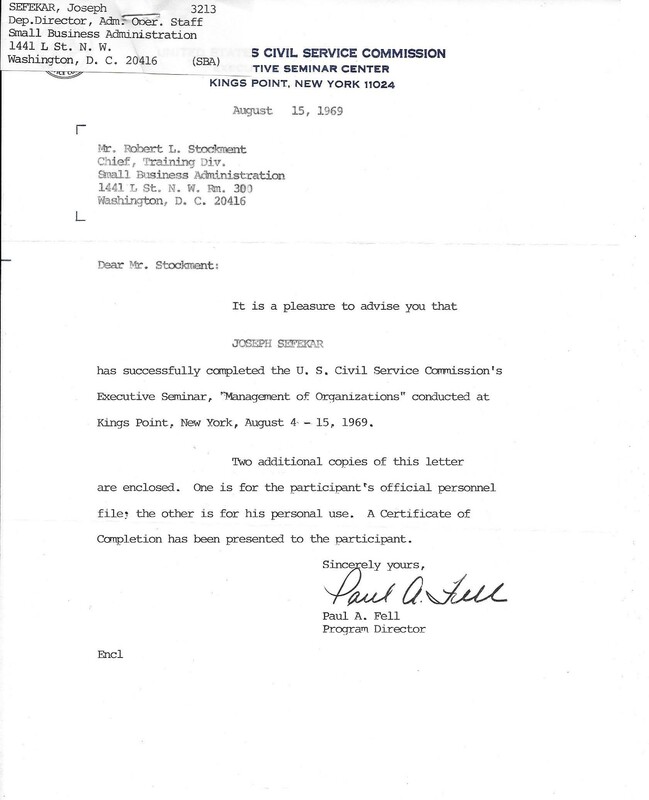 In August 1969, I was enrolled in a one week Personnel Seminar given by the Maritime Administration at Kings Point, Great Neck, L.I., N.Y., representing the Small Business Administration. The world was clamoring for his collection. Italy offered the building that Galileo lived in, but Hirshhorn wouldn’t spring for the cost of having a road paved up the hill on which the home rested. I read the article and I mused to myself, “this building is being built in Washington. Why couldn’t I be considered for a job there”? My first job, as a receptionist was with Hirshhorn (in 1933), so it could be possible that my last job (I now had 30 years’ Federal service, including military time) would be with Hirshhorn. 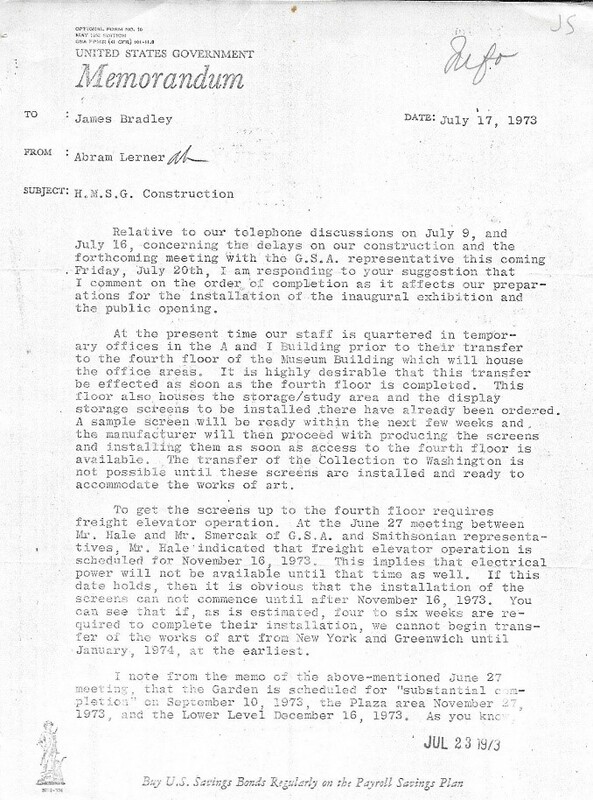 As a result, during the week of August 18, 1969, I called Abram Lerner, the appointed curator of the new museum and requested an interview for a possible position in his office. We agreed to meet on Friday, August 22, 2 PM at his office, after my seminar was through. I have to admit that I had two other big guns in my corner. 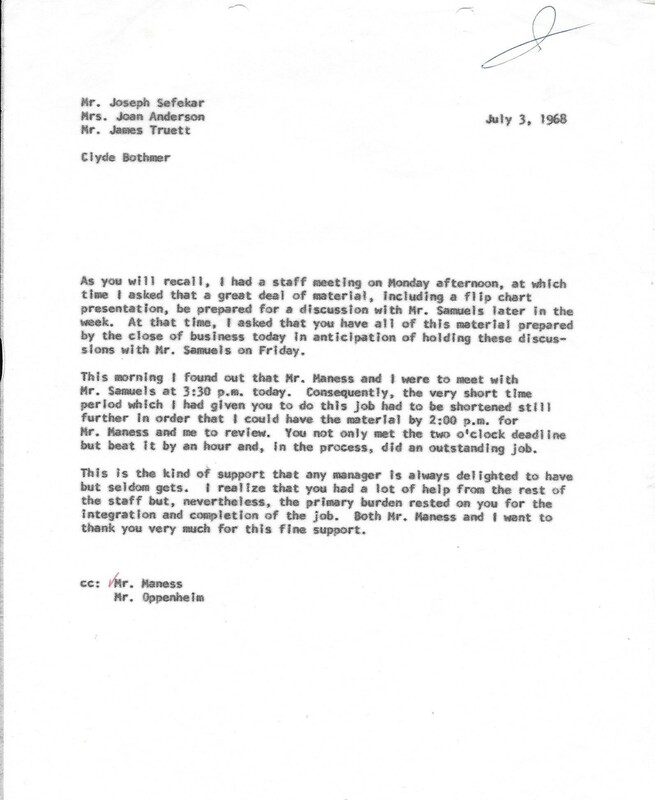 My brother-in-law, Hyman Goldstein, contacted Dave Tarlow, who was Mr. Hirshhorn’s accountant for 60 years and whom I had worked with during my first position with Hirshhorn in 1933. 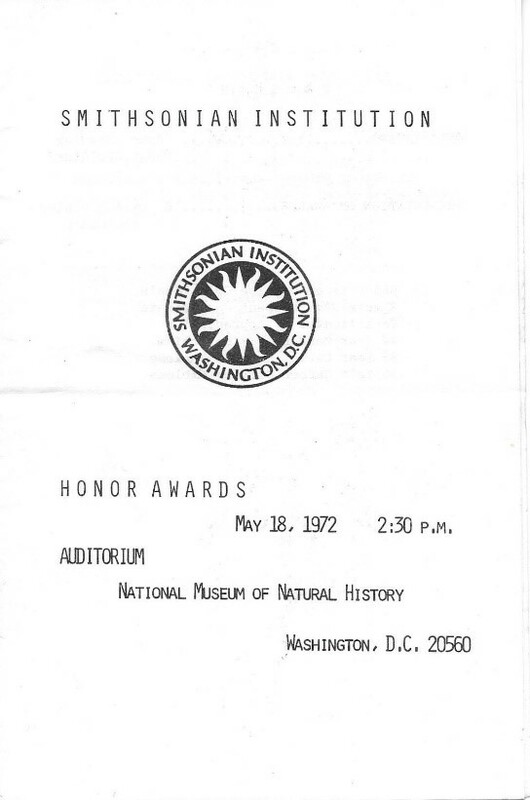 I should mention that I did have some contact with Hirshhorn in the summer of 1945. I had come back from military service in Europe in June 1945 for my 30-day furlough. I visited my sister Lucy, who lived in Canada. She knew Hirshhorn, through her husband Hyman and I can remember that Mr. Hirshhorn took us out for an ice cream soda. I hadn’t spoken to him since the early 1930’s, but he must have remembered that shy, “why don’t you speak up and stand straight” kid. At my receptionist job, I was just out of a commercial class in high school, I was folding a letter to fit a small envelope. I was engrossed in getting the right fold, as I was taught. As he passed my desk, he said, “that’s a long process to fold a paper. Just do it this way”. And he grabbed the sheet of paper – zip zip and it was ready for insertion in the envelope. That was Hirshhorn – impatient, and always moving. He worked with 20 telephones all around him. He traveled between New York and Canada before the planes were ready for him. He would take the sleeper trains at night, for the long ride from NYC to Toronto, Canada and arrive in the AM for a full day’s work. He would return the same night and be ready for the fun the next day in New York. Little did I know that fast forwarding the years preparing for the operation and opening of the Museum in 1974 that I would spend over two years commuting via Eastern Airlines on a Monday through Thursday job from Washington to New York and back while the museum was constructed on the Capitol Mall. The first official undertaking coupled with first shovel of dirt began with official proclamation ceremony words presented by Pres. Lyndon B. Johnson, September 1969. 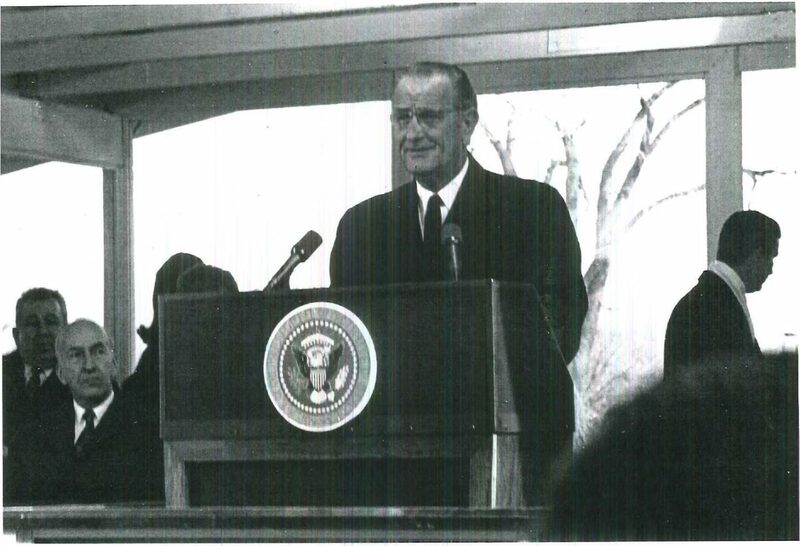 Figure #8-13: Commencement of the Dedication for the Building of the Hirshhorn Museum with President Lyndon Johnson Sept. 1969; Washington Post. 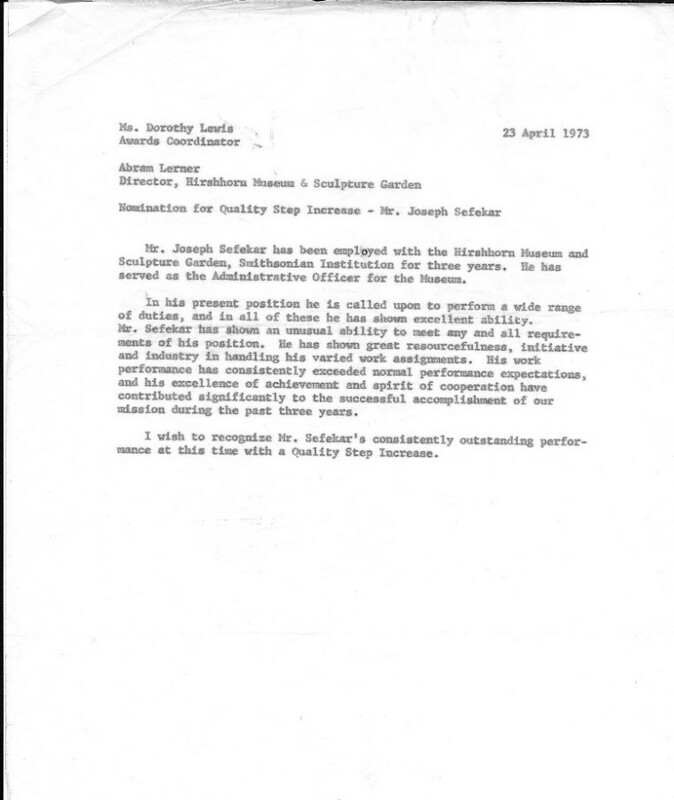 Good things don’t happen fast, so it wasn’t until January 1970 that Mr. Lerner convinced Mr. Hirshhorn that I was the one qualified for the job. I never knew if there were any Smithsonian employees considered for a job they who would have given their eyeteeth for. 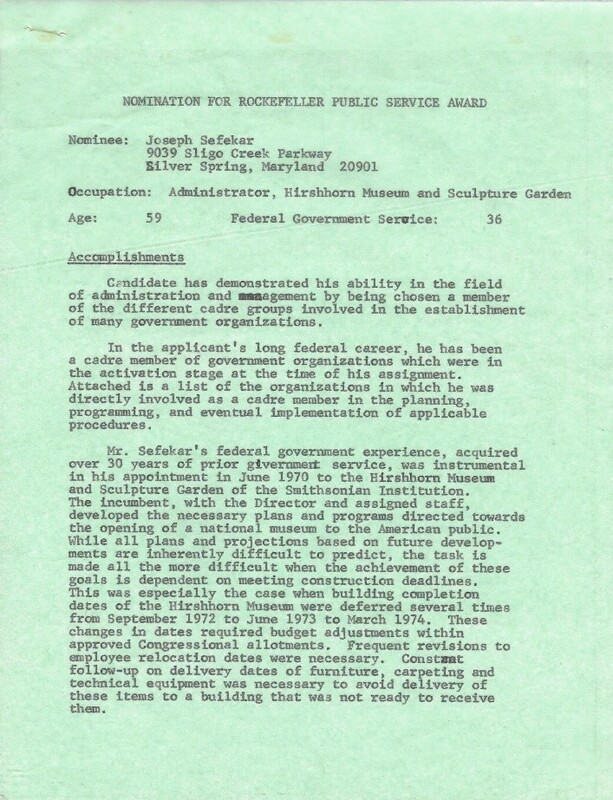 Mr. Hirshhorn wrote directly to Mr. Dillon S. Ripley, Secretary of the Smithsonian Institution, Wash., D.C. On January 13, 1970 Mr. Hirshhorn wrote and indicated that I had been “in his employ many years ago and his experience and education in the budget and management fields qualify him to handle the many administrative and technical problems facing us.” Mr. Ripley’s reply on Jan 26, 1970 wasn’t so enthusiastic. 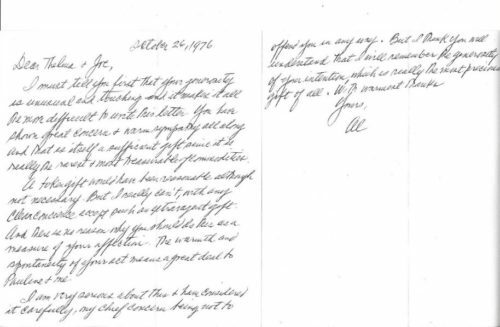 It was really truly a “Yaley” response – smooth and “no.” But a hand written postscript at the end of the typewritten letter, left the door open. “P.S. we’ll keep him in mind if we get additional budget authority this time. (Insert letter** Material will appear in book). I continued my job through winter and spring of 1970 at SBA. 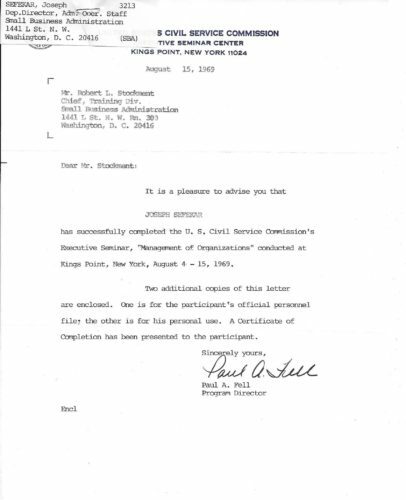 My supervisor, Morty Oppenheim, knew of the possible change to come, but did not pressure me in my duties. Finally, in early June, the logjam started to break up. I received a call to see Mr. Hirshhorn at his Park Avenue apartment in NYC. It was a low-key interview – we easily bridged the elapse of time from our first meeting in 1934 over 35 years ago.